The adventure of picking up the plane from Just Aircraft, part 1. For the record, actually picking up the plane wasn’t really an adventure. The only thing that went “wrong” was that I expected to pull up Monday morning at 7am and find a plane wrapped, boxed, and ready to load. What I pulled up and found was the the plane was there, by the door ready to load, in all its pieces and parts. Nothing was wrapped or packaged. It ended up taking three hours with three of their folks working on it, to get everything packaged and ready to go. I remember thinking the charge for packaging of the kit was a bit excessive when I looked at the quote. After watching the amount of care, plastic, padding, and duct tape that went into prepping for shipment, I think they may be undercharging. Also as I was standing there talking to people, I found out why the plane was not ready. Not because I asked the question, but because they started telling stories of the different ways that people show up to take their plane home. Crazy stories. One guy apparently strapped the whole contraption to the top of a Jeep! I guess they don’t package anything up till they see you pull up and see how it is going to be loaded. Makes sense. He smiles and I reassure him we’ll get out. I take a look at the status of the truck. About 3-4″ deep mud where the tires have been. Beautiful roadside grass everywhere else. No indication that it would be this soft. Oh well. I ask if he has his family with him. I ask who was driving when they pulled off. I ask, “Is she mad at you?” with a big smile. “Best stay over here with me then, it is safer!” I say with a laugh. I find you can either laugh or cry in situations like this. Better to laugh if you can. Nobody is shooting at us. Nobody is dying. So in reality it is just an adventure. After taking a look at the truck and the soil, I harken back to my surfing days when I used to go surfing with my friends. I learned from Jim that before you go out on the beach, you let the air in your tired down from highway pressure to 15-20 psi. This softens the tires and improves the ground pressure. I’ve seen trucks buried nearly to the frame magically levitate out of a hole once the air pressure was dropped. My tires are setup for carrying a load on a 1 ton pickup. They run at 70 psi. As I chatted with the dad, I started letting air out of the tires. While I was letting air out, a wrecker stopped at the minivan, which was still 100 yards ahead of me. He pulled 1/2 off the pavement and half on (he’s a professional). After a quick chat with dad, he decided to leave. Except that even 1/2 on the pavement, he got stuck. I watched him for a while slipping and spinning while I was letting my air out. He eventually used some of his wrecker equipment to get himself back onto the pavement and he left. It took about 30 minutes to get me to 20 psi. I gave the truck a try. Nope, while I could move I couldn’t get back to the pavement. I let another 5 psi out and ran them at 15. After much back and forth, I was able to get one tire onto the pavement. Viola! With a 4 wheel drive truck, one tire is all I need. Thanks Jim! You never know when a life lesson from surfing will come in handy as an adult. I pulled my now exceedingly muddy truck down to just ahead of the minivan and hopped out. I was 1/2 on, and 1/2 off the road, with no wrecker lights to guard me. Also, in the 1 hour we were there, no cop ever came by even though the minivan driver had called them immediately after getting stuck. Oh well. I got out of the truck, pulled out the jerk strap, and handed it to the dad. I explained how I wanted him to hook it up to the minivan, that I didn’t want to damage anything while pulling it out. I also explained, quietly to him, that I was going to have him get down in the mud and hook everything up. He’d get muddy, but he’d be a hero to his wife and kids. If I did it, he’d be the idiot who got them stuck and I’d be the hero. No good. He nodded and went to work. While he was finding a spot to hook things up, a kid came up to me from seemingly nowhere. I looked over his shoulder, and across the highway. A Ford Mustang was nose down off the shoulder on the opposite side of the road. I seriously doubted he’d be able to back up that incline even if the ground was firm. No way with as wet as it was. Ugh! Now I had to get him out as well. I thanked the kid for stopping and told him his a very generous to risk himself to help. Just hang out a minute and I’d get him unstuck as well. After some fiddling with straps, ropes, etc, we finally got hooked up, the lower A arm on the van hooked to the back of the trailer seemed to be the best way although we tried the tie down ring on the front as well. I explained how this was going to work, and we pulled the minivan through the mud and back up to the asphalt. While we were getting straps off and prepping to cross the highway and get the Mustang out, I hear some guy barking orders. 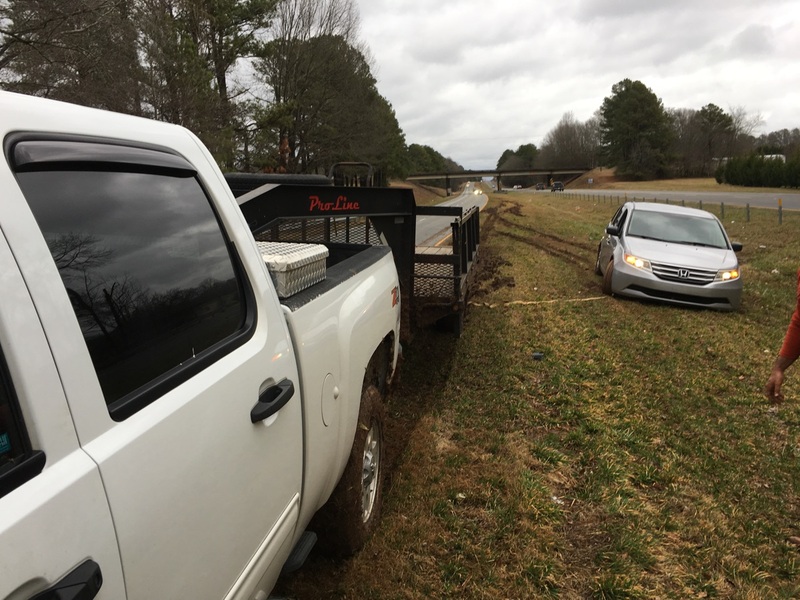 I look up to see what looked like a fireman type guy in a pickup truck, yelling to the dad that my truck needed to be gotten off the road before we caused an accident. I’d been really jovial up to that point. Helping people is fun. That guy made me pretty mad. But I just chewed my lip and he drove off. Thankfully I never actually talked to him or I may have said something not quite so friendly. Mom and the kids took off, leaving dad to help me get the Mustang out. Mustangs have a solid rear axle because apparently 1960s technology doesn’t need to be updated. It also makes for an excellent place to hook a tow strap. We hooked the jerk strap to the axle, then to the front recovery hooks on my truck. This was after crossing a highway on wobbly tires, covered in mud, while pulling a trailer. Fun. After taking up the slack, I backed the kid out and got him on the road. I thanked him again for being willing to stop and sent him back to Clemson where he was a student. During this time, an Army veteran had stopped and was offering to help as well. With the kid gone, mom picking up the dad, covered in mud and grease, and wobbly tires, I drove the Army guy back to his vehicle which miraculously wasn’t stuck at all, and bid him farewell. Then I hopped back onto 123 and went to the next exit on tires that were woefully under-inflated to be on the highway. I’m still pulling a trailer and now hunting around for a gas station where I can put air in them. It’s about 5:45 and getting dark on a Sunday night. I’m getting nervous that I won’t be able to find air in this tiny little town. I do carry a portable air compressor that runs off of 12 volts, but it takes FOREVER to pump any volume of air. It truly is a last ditch tool. Plus I haven’t used it in forever so who knows if it even works. I find the only gas station in town, find their air compressor, drop 75 cents in it, and it springs to life! Yeah! So much for no good deed goes unpunished. I fill up as best I can the two closest tires and I can tell by the end that the little pump is doing about all it can. I pull out my tire gauge and it says 28psi. I run at 70psi. Ugh. That isn’t good. Another 75 cents and I get 28psi on the other side of the truck. Now I can run at low pressure but not very far nor very fast. I look at my hotel directions and I’m only 15 miles from the hotel. It’s now full dark and Sunday night. Better to be at the hotel and figure it out tomorrow. I limp to the hotel, grab a bite, and grab some shut eye, on the way noting places that might have air at 8am on a Monday. When I look at my distance from the hotel to the factory, I find that it is only 7 miles to the factory. So I could be at the factory at 7am and get air there, or I can wait till 8am, get air in town, and then show up at probably 8:30 or so. Since I have to drive 9.5 hours that day, I go to the factory where after grabbing every air hose in the place, we stretch out enough hoses that I can spend 30 minutes, even with their really good air pressure, filling my tires back up to normal. Waiting to load the airplane while sweet, sweet pressurized air flows into the tires. Since I had three hours to spend, I was able to look at a lot of the factory again, and talk to a number of folks. But that is part of the next story. It is time to pick up the plane! Friday was crazy busy. 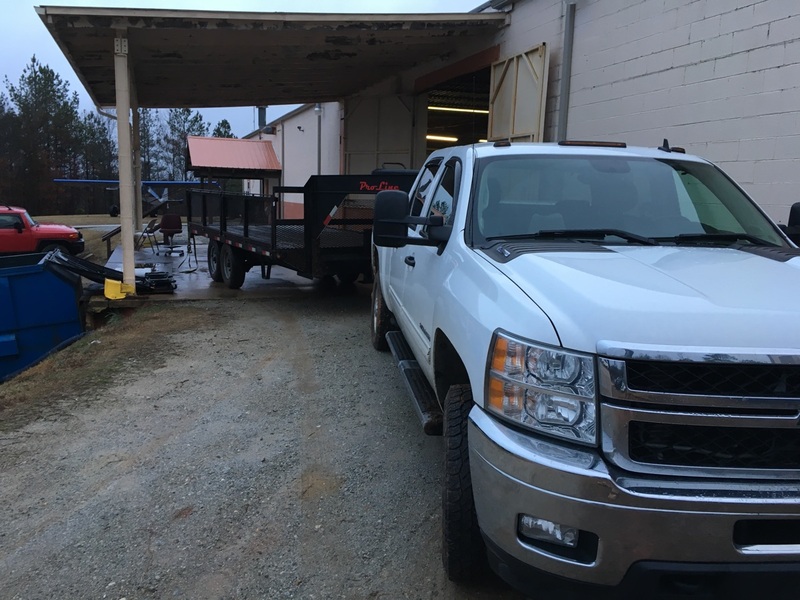 Lot’s of running around, appointments, my first time going for my BasicMed doctor’s visit, stopping by HRJ to check on the annual for 54SS, and then finally heading to Siler City to pick up 650 lbs of beef from the processor and putting it away. While all that is on my mind, what is really on my mind is that Sunday I leave for Walhalla to pick up N41RW. Oh, I forgot to mention before, that’s the tail number that I reserved. I wanted N4RW but that one was taken, of course. The reason for the tail number? My father’s initials, and frankly his name, was RW. That is what he went by. Only my mother or the latest idiot from Deere trying to establish a relationship called him Rufus. My father encouraged me to learn to fly. He was a ball and tail gunner on B17s in WWII. He always respected his pilots and thought it was great if I learned how to fly. Were it not for him, I certainly wouldn’t have made it through, to now be passing a love of aviation onto my children. So this airplane is 4 one RW, my father. So this was my first foray into the Basic Med world. It took more doing to convince the doctor’s office that the could indeed do the exam than the actual exam took. I can’t think of when I’ve had a full exam. My 20s maybe? Everything checked out fine, the doctor was funny and we laughed through the process. She asked me if I was feeling blue or depressed (standard questions). I’m getting a less intrusive medical and about to go pick up a new airplane? Nope, I’m feeling pretty darn good! Our Lance was due for its first annual since our purchase in May. The first annual is always scary. Sure, you do a pre-buy but you never know what is going to appear as a problem once things start getting taken apart. I had 6-7k as my budget, and that was assuming nothing dramatic was found. With this final check up on the process, we came in a tad over 3k. The last first annual I’d been part of was over 17k so this was way better than I had hoped. We have a clean bill of health, a good running engine, and a nicely upgraded panel. Now we only need to address the autopilot not holding altitude and we are golden. Now it’s time to head out to Walhalla, SC to be ready to pick up the airplane first thing Monday morning. I have the truck ready to go, the trailer hooked up and ready to ride, snacks, a change of clothes, and some audio books, which I’m going to need. It is about five hours, not including stops, to get to Just from my house. I’m actually stopping at a motel just outside of Walhalla, spending the night, then proceeding on the next morning. I’ll load everything, pull an inventory of what I can see, and then head East bound. I won’t be going back home. Instead I’ll be heading to Grantsboro to drop off the plane with Robbie, whom I’ll be building with the first two weeks. That adds a couple of hours to the return trip. About seven hours door to door, again not including stops. Then I unload, turn around, and drive the 2.5 hours home. Monday is going to be a LONG day and a LOT of miles. But my phone is loaded with audio books and podcasts, and I have some snacks to keep me from stopping too often. Hopefully things go off without a hitch and come Tuesday morning I’ll be a kit plane owner. You ever had to pretend to be an adult instead of being a squealing little girl bouncing up and down and screaming? Yeah, me too. I received that first question from my buddy Dan, just as a casual aside to another conversation we were having. He’s in the Army down at Bragg. He also owns half of my airplane, N54SS. Great guy, great family, perfect partner in an airplane. But forget all that, he has connections to the coolest toys on the planet, Uncle Sam’s personal toy collection that is sadly kept behind lock and key and M16 so I can’t go play with them. Till today. I had occasion to go to something like this once before, maybe twenty years ago? 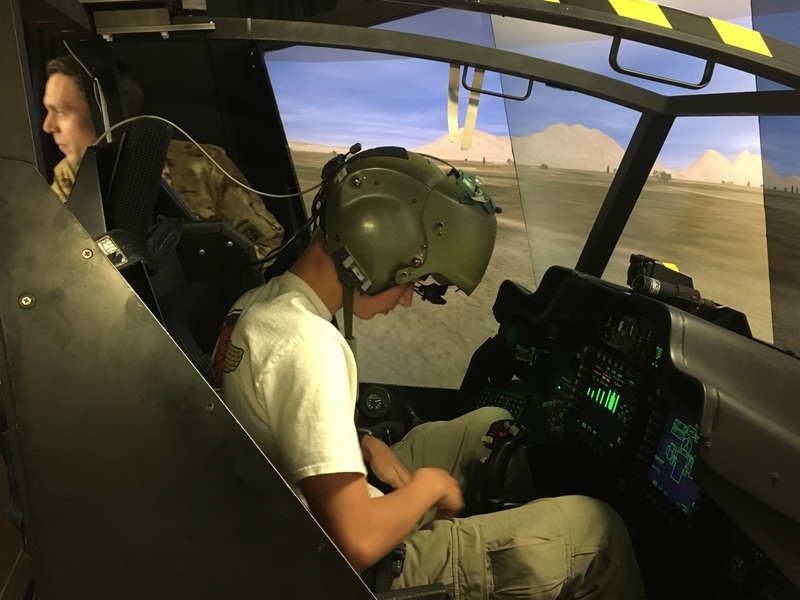 I had a friend of a friend who was going to flight school at Camp Pendleton for the AH-1W Cobra. 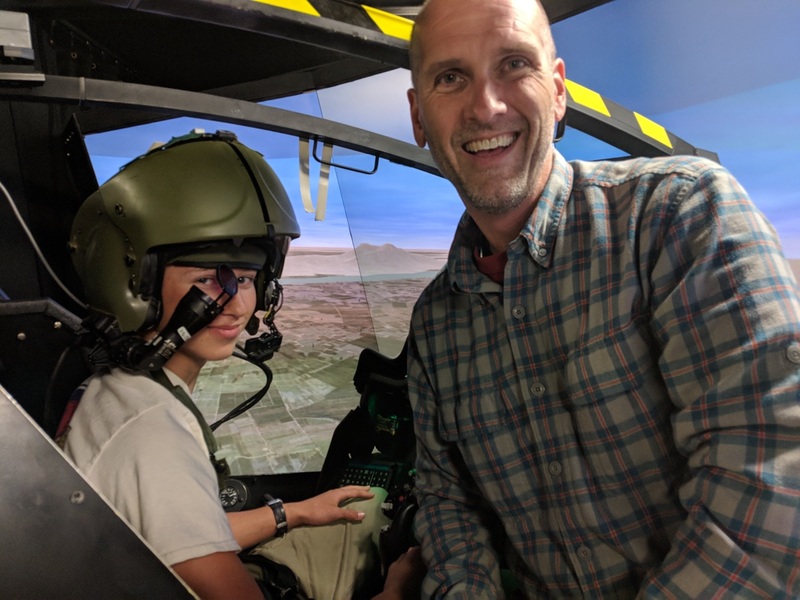 Somehow he wrangled us a quick visit to the simulator room where we could fly the Cobra simulator for about 30 minutes. It was a quick in and out, and he was a student at the time so there was a lot of bowing and scraping and staying out of the way. BUT, it was SUPER COOL and something I’ve talked about every since. 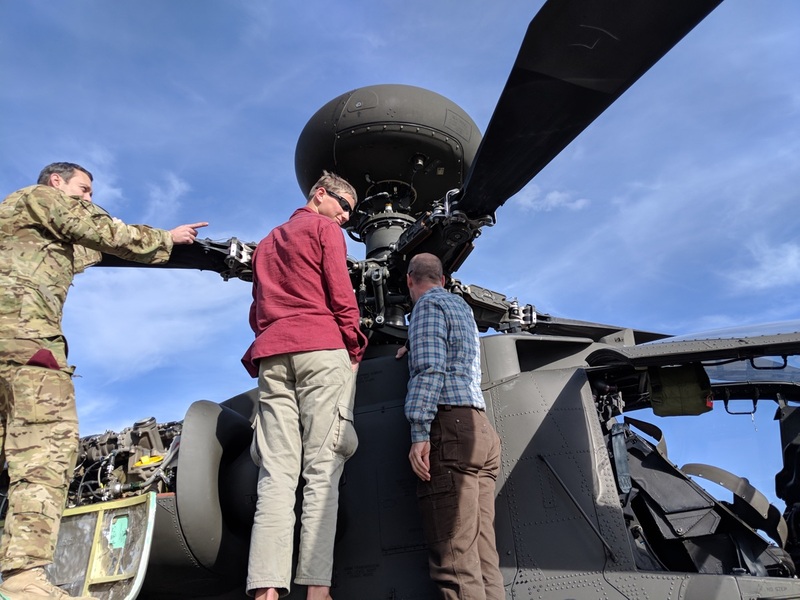 So Spork and I blow off a considerable chunk of school and work and head to Simmons to meet Dan and Christian, our guide through the world of Apaches. Christian is a Warrant Officer in the Army. He also happens to be a former Major who resigned his commission and busted himself back to Warrant Officer so that he could fly more and push paper less. I liked him immediately. 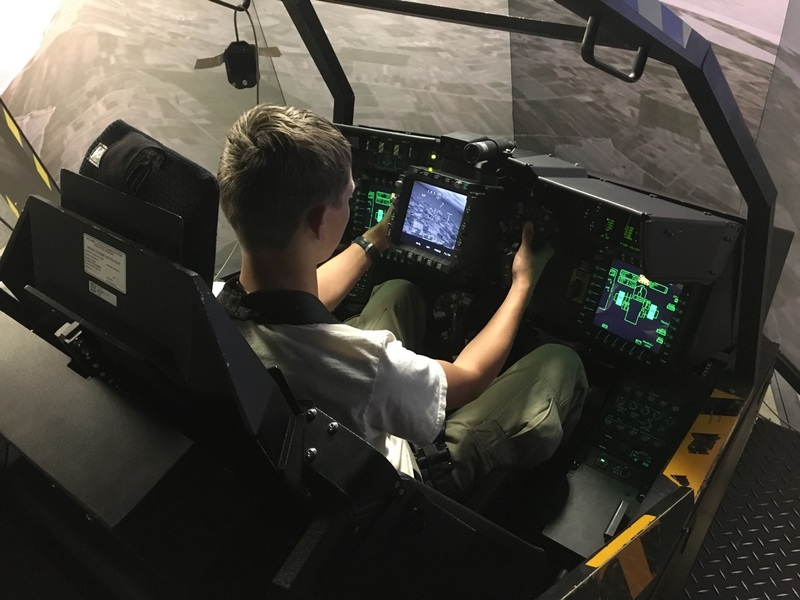 After going through security and getting our pass, we head straight to the simulator where Christian gives me the 5 minute instructions on how to operate a 23,000 lb helicopter. 4 minutes of the 5 is spent on getting his personal helmet on my watermelon sized head. I could hear my brain squishing out of my ears as the helmet jammed into place, but I didn’t care. I was going to fly this thing! In case you don’t know Firebirds, here is the promo. And if you want to suffer through not only the Movie, but a bad copy which seems to be sped up for some reason, here is the entire movie on Youtube. Spork in the gunners seat. While I was getting set up in the pilots seat, Spork was getting set up in the gunners seat. This would be the front seat of the helicopter, the pilot operates from the rear seat. We only had the one helmet, Christian’s actual flight helmet, so I couldn’t talk to Spork during our flight which was unfortunate. I could however tell when he fired something. I spent a lot of time trying to point him at things I thought he might want to shoot. After the flight I asked why he didn’t shoot more. I didn’t want to waste ammo. The electronic bullets too expensive for ya? We had a good laugh. He did get through a good amount of 30mm and fired off a bunch of rockets before we were done. He had fun. The last time I flew a helicopter was years ago. Like over 10 years ago. Heck maybe 20 years ago, I don’t really remember. Cyclic, collective, torque gauges, take it slow. 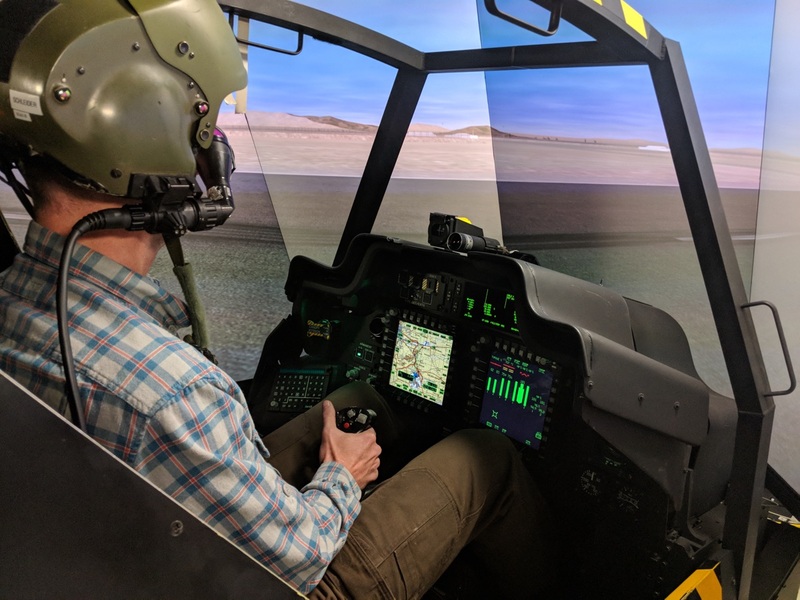 I picked up into a hover that would make an instructor cringe, but for me it was actually pretty good considering the rust and lack of familiarity with the helicopter. I accelerated down the runway and cruised around for a minute. Then I headed back down the runway the other direction and pulled into a quick stop, which is the most fun I’ve ever had in an actual helicopter. After several quick stops, I did some hover practice and various other maneuvers I remembered from flight training. It was a hoot. Then I just did some general flying while Spork launched 30mm and rockets at whatever he felt like. I tried feeling out the Apache. I found that it was very easy to fly, except it’s not a 1400 pound R22. It’s a 23,000 lb beast of a machine. If you let a big sink rate develop, it does not just pop back to level flight like a light helicopter. You have to plan your pullout to avoid the cumulogranite. I may have overtorqued the engines a wee bit discovering that. Thankfully they were electronic engines. After my time in the cockpit, we got Spork into the pilots seat. Christian did an excellent job of getting him acclimated and before long he was flying. After the professional got out of the way, I stepped in to give some instruction. I told Spork that he was doing well and I was proud of him. I’ve flown a helicopter before dad. He has exactly one hour of R22 time. 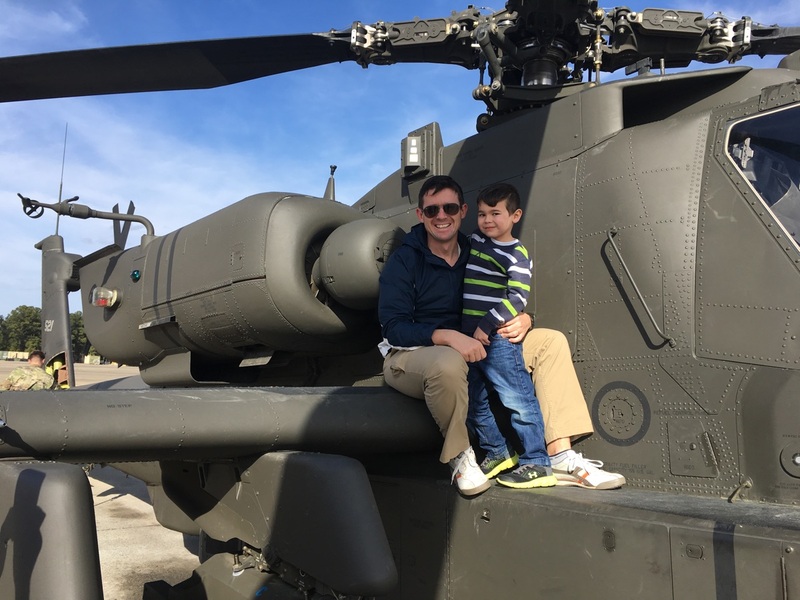 So in his mind, getting out of an R22 and into an AH-64 Apache is, “Meh, it’s the same thing.” And I guess it was. He was cool as a cucumber. He flew so well that after a few minutes Christian said, let’s let him fly at night. The Apache was designed to own the night. That’s its purpose, which I didn’t know. So we turned off the lights, set him up for night flying which involved getting the monocular even more adjusted, fiddled with a bunch of knobs in the cockpit to get the displays just right, and then turned him loose. He flew like it was no problem, taking off from a field and zooming around while the gunner was taking shots here and there. Then he flew back to another area and proceeded to make a zero ambient visibility, monocle driven night landing with hardly a bump when he set it down. I guess the eye roll was warranted. After our flight, we proceeded out to the flight line and the maintenance hanger where we talked about Phase inspections, the maintenance process, flight times, etc. Walking around the real deal. We then went out on the flight line to look at one of the birds. This was an open the panels, poke at things, and ask any question you want walk around. Other than going for an actual flight, this was as close as you can get. We opened the engine compartments, talked about the systems, and generally did everything you could think to do. While we were crawling over our aircraft, there were helicopters landing, warming up, taking off, practicing, etc. We weren’t close enough to feel the rotor wash of the helicopters, but only because we didn’t happen to be directly beside one taking off. Again, about as close as you can get without visiting the recruiter and signing on the dotted line. Dan seemed surprised I was so excited to visit Simmons and see the Apaches. I guess I never mentioned that I’m a huge military nerd, a huge helicopter nerd, and of course an aviation nerd. This trip was epic for me and scratched all of my itches. It also certainly showed Spork that there are more options in the military than just flying pointy nosed jets. I’m not saying he’s signing up tomorrow to be a Warrant Officer, but he definitely knows it is an option at this point. A huge thank you to both Dan and Christian for taking their day to show a couple of civilians around and treat us like royalty. Yesterday both owners met at the airport and took the airplane up for another test flight. Our configuration was this. GTX345 with latest software update, bluetooth enabled. Unfortunately, I didn’t think to keep on of the iPads with version 9.4.3 of Foreflight to compare. We also took our Stratus on board for comparison, although we did not use it. Ask and ye shall receive! In our last update one of my conclusions was that we needed a VFR day so we were comfortable flying with a possibly broken setup, but we needed some radar returns on the map so we had something to display. Just off the coast of VA/NC we had a decent sized green return. It was about 200 miles from us at KHRJ so we planned to fly to KOCW to make sure we were close enough to it that it would be part of our regional radar return. Here we’ve connected to 6 towers on the climb out, but more importantly we’ve gotten our second update already. The first update was at 10:30, so the every 15 minutes update that we’d gotten used to. Then this update was at 10:35! The 5 minute update that Foreflight had promised with the new update. More importantly, the cross hatch lines are gone as is the message that radar is not available. Now we are getting into the realm of where I don’t know what is correct or not. I don’t recall seeing the above example in the past as I generally don’t fly offshore. Over land, radar shows available. Offshore, we see just the corner of the green band before the radar not available section starts up. We did give this a few minutes to see if it would update with more information. It did not. If you look at the first screen capture in this post, it shows more of the band of radar returns, further off shore. For a single engine pilot who usually doesn’t usually go over water, I think it is working ok. I am however flying 40 minutes over the ocean off the coast of Florida next month so I’d love an opinion here as to what is going on from tech support. Is this because the data source is different on the ground vs. in the air? I realize it transmits differently but is it actually a different source? We did receive this error again. Only one time. We did have the download error again that we’ve had in previous flights. We received it only once. I don’t know what is not downloading, nor do I know what is causing the error. I would like to know what this error means. You can see from the data block, this is after we were well established in flight so there shouldn’t have been any connectivity issues with bluetooth. Plus with everything working, we were not adjusting connections, experimenting, etc. This just popped up in the middle of what would otherwise be a normal flight. We know from previous testing that the data from the FAA is being transmitted, and received. 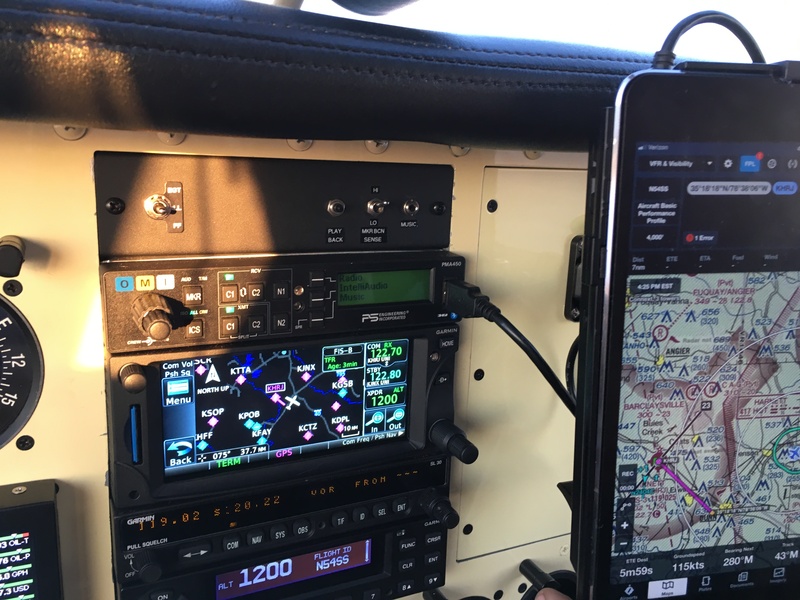 We know from previous testing the Garmin Pilot is able to receive and display the FIS-B data from either the GTX345 or the FS510. 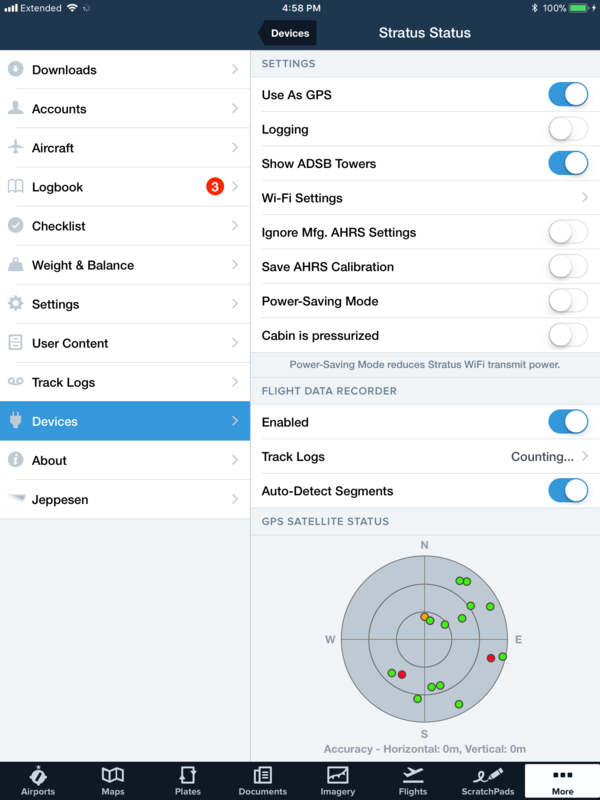 We know from yesterday’s testing that ForeFlight is now able to display FIS-B data from the FS510, at least over CONUS. We did not test the GTX345 to see how it was working. It appears that things are working as they should, as much as they have been at any point since our initial install. I would like some clarity on what is going on with the offshore returns. Why do we get the “radar not available” there and more specifically, why is it different than the radar we get on the ground? Will I get radar not available off of Florida (heading towards the Bahamas) next month when I try to fly offshore? I’d also like an explanation, or a suggestion on what to test, for the download error above. What is not being downloaded? What should I do to rectify this? Monday we took N54SS back to Cheraw, SC to have the transponder updated to the latest version of the software. This was Garmin’s recommendation and one I wasn’t too keen on. You see, when we connected to the GTX 345 only, things actually worked fairly well. We lost the 510’s connectivity to the iPads, but other than that, I felt that by connecting to the 345 for my trip, I could make the trip safely with proper data transfer between the 345 and the iPad. Both owners have trips in the next 30 days so I felt like maybe the devil I knew vs. the one I didn’t was the better choice. But I needed to be in FAY on Monday to fly with the Civil Air Patrol, and Daniel was available to fly with me down to CQW that afternoon, so everything lined up to have the software updated and see what happened. We did have some actionable results from our update and test flight, which I will detail with screen captures below. But before we get to the software update, let me share some of the tech support we received from Foreflight after our previous post. As usual, their tech support is email only, but in my experience, very personable and written in plain English. And more importantly, in actual English as opposed to tech support from India English. Not a minor distinction when you are having to deal with tech support. Chris here. I have been looking at your case. 1. 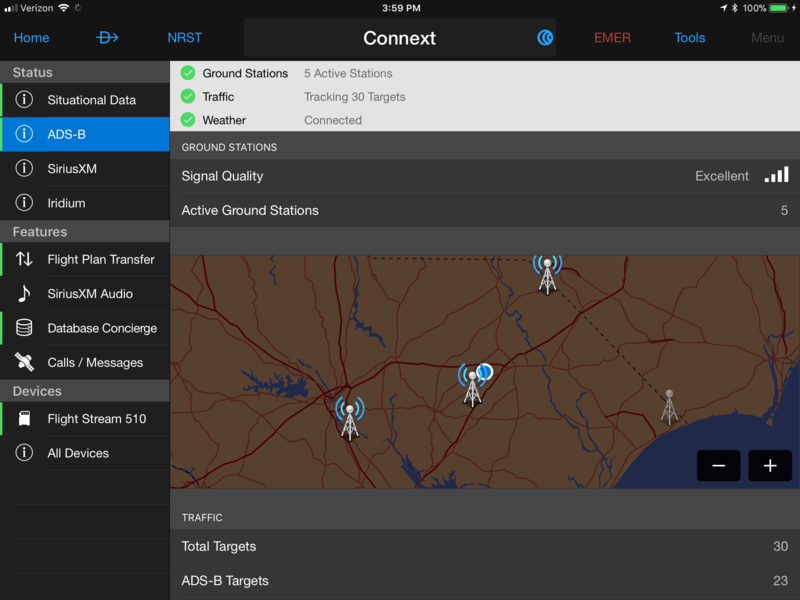 The upcoming software update to ForeFlight (version 9.5) will allow Regional radar data to stream to the app (in addition to CONUS radar.) Regional radar updates on a set schedule of 5 minutes, compared to the 15 minutes for CONUS. 2. The cross-hatched “Radar not available” message on your map stems from a bug that is specific to integration with Garmin. It is a problem with Garmin encoding clear air as “no data.” We are working with them on resolving this issue. I currently do not have a timeline for when that may be completed. 3. An observation: per your iPad screenshots, it appears that you are simultaneously connected via Bluetooth to your Flight Stream 510 and your GTX-345. This is generally not recommended by Garmin – instead, you should disable Bluetooth on the GTX-345, and on your GTN panel set your Flight Stream 510 as the ADS-B gateway. Your installer can likely provide instructions on how to do this. This should account for each of the errors and discrepancies you reported. Please take a look at that and let us know if you have any other questions. We’re happy to help! So based on the above from Foreflight, it appears that we know a few things. One. There is a known issue between Foreflight and Garmin. Either all the other pilots flying Garmin panels out there were like myself and didn’t notice this error or we have something specific to our install. Maybe our software is newer than everyone elses? I don’t know. But there are thousands of pilots using Foreflight and Garmin every day, and yet it’s taken us this long to get to the point of “it’s a known problem.” Why is the internet not filled with these complaints? Why is there not an alert published by Foreflight/Garmin alerting people to this issue? We did do some internet research on this before calling in the experts, trying to find out what the issue was. Other than one person in an internet forum (Hi BGFYYankee!) that is having the same issue, nobody else seems to either have the issue, or notice it. In fact, our internet cohort has had to pay his shop to update his software and troubleshoot what we are now being told is a known issue. Two. Version 9.5 of Foreflight will address this issue, at least partially. It will allow regional data to stream and update every 5 minutes vs. every 15 minutes for CONUS radar. Hmm, I’ve flown about 150 hours behind a Foreflight tablet now. Until I got into my airplane with this panel install, I never noticed an issue with update rates, streaming Regional vs. CONUS, etc. When I look at weather 700 miles away, it’s blocky and pixelated. Everything within 250 miles is just fine. That I’ve noticed since day one. But having flown around thunderstorms with Foreflight (in VMC of course) I was very impressed with the resolution and accuracy of the radar returns, up to the point of penetrating light green bands and having the rain start pretty much exactly when the nose of the little blue airplane touched the edge of the green band on the iPad. I was of course watching the update time stamp very carefully at the time, and found the updates to be within a few minutes of current. I guess I don’t follow how updating at 5 minutes in a future release will be different from what we used to get just normally. Or better said, how is this enhancement new when I have multiple experiences with it working as is being described in the past? Three. We were erroneously connected to both devices, the 345 and the 510. While that is true for myself, the other owner had only ever connected to the 510, yet we both have and had the same issues. “Connected to too many devices” is something I’ve heard from our avionics installer, from tech support, and my goodness, from the internet. And I’m ok with getting rid of redundant connections, yet I’ve found it to not actually be the problem. As I said, one iPad, for the Dan who actually noticed the problem to start with, was never connected to the GTX345. I was connected to both, because I was there to pick up the plane after the install and we went through the connection procedures for both at the time and simply never changed it. While I have found the bluetooth connections to become unstable with the repeated connects, changes, forget devices, reconnect, etc. of testing, through all the testing we’ve done, I’ve not actually found much problem with the connections once they are established. Not to introduce another topic here, but I’ve found that occasionally I would get out to the runway for runup and Foreflight had no bluetooth connection. Each time, I’ve found the problem to be on the iPad, not anything else. I restart bluetooth, restart Foreflight, or on one occasion restart the iPad itself and everything connects normally for the rest of the flight. Multiple bluetooth connections seem to be relatively robust, and when they do fail it seems to be an overall bluetooth issue, not something specific to the airplane. Said another way, I have as many issues with my phone not connecting to my car stereo as I have with my iPad not connecting to my Garmin panel, and with a failure mode exactly the same. Regardless, we’ve connected to both, one, neither, all three(including the Stratus, which is wifi I know) and with as few as one iOS device and as many as four and actual bluetooth connections seem to be reliable and stable. We’ve found no evidence that connecting to more than one bluetooth source causes problems. I get the impression that the advice to connect to only one device is kind of like having you reboot your computer as step one to any tech support question on a PC. It’s always to first thing to try. We also had written feedback from Garmin. Again, they had someone speaking English, which when you are dealing with a global corporation, is a blessing. They also have phone in support, at least for the professional shop, which is great. Here is what Garmin had to say. I ran the latest blog past my engineering team and they found the GTX 345 software to be out-of-date at v2.05 (see attachment, red brackets) – the current version for the GTX 345 is 2.12. They stated that this needs to be updated to address the issue. If, after everything is completely updated, the customers are still experiencing this issue please let us know because it will need to be addressed by our engineers. Just to keep you in the loop, I recieved the following from Garmin. Disregard their request for the software versions and the Garmin Pilot app information. I sent them the link to the updated blog entry. There is no need to perform any additional testing at this time, until they have a chance to review the new information. I’ve reviewed the entire blog and honestly have to applaud the level of testing and detailed record keeping they put into troubleshooting this issue. 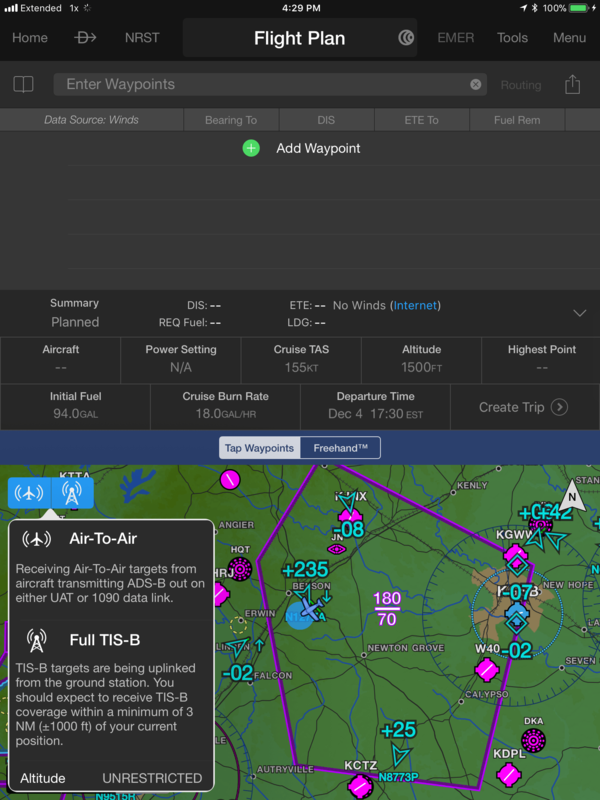 It appears from their description of events that the issue can be narrowed down to either the ForeFlight application, the FlightStream 510, or compatibility between the two. 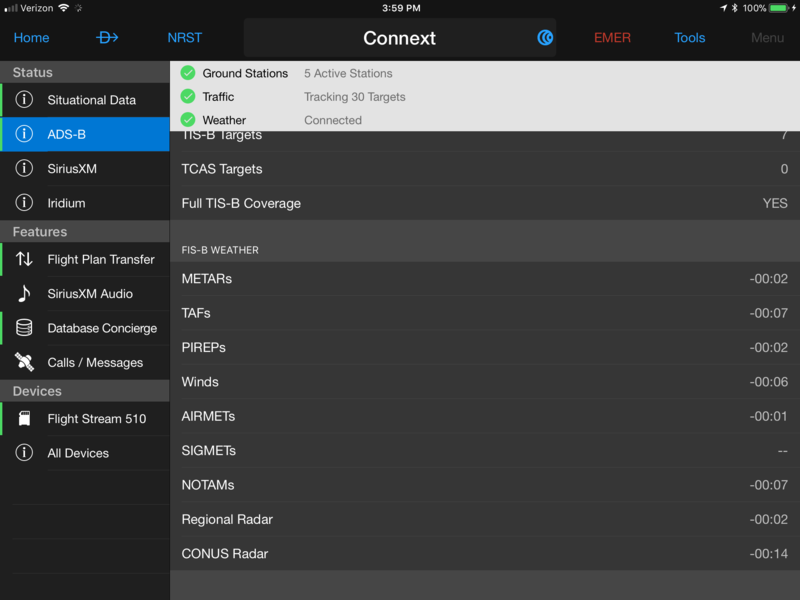 Previously, there was a known issue with ForeFlight having trouble receiving weather data, much like this, from a FlightStream 510/GTN cockpit installation. 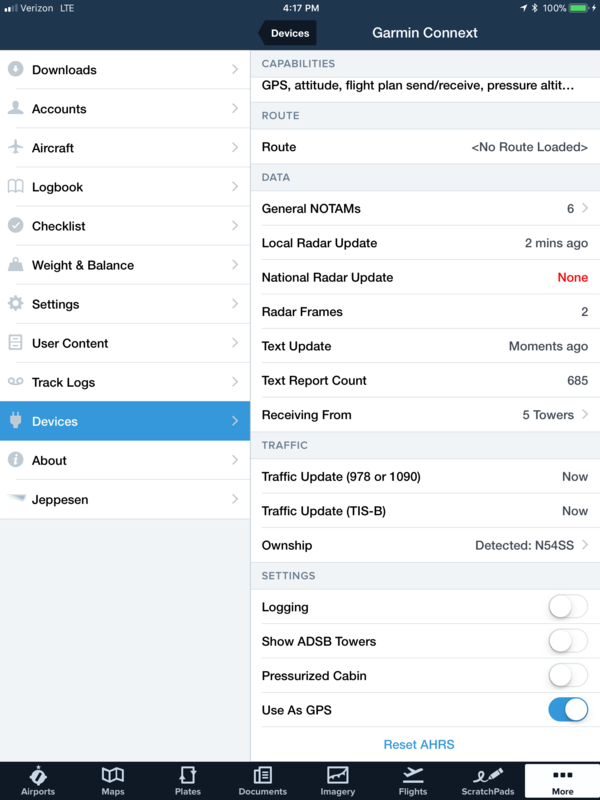 This was supposed to be addressed in the latest version of the ForeFlight application and GTN software v6.41. Before anything else, please double-check that the GTN has been updated to the latest v6.41. It would also further our knowledge of the problem to see if this radar display issue persists on the iPads while using the Garmin Pilot application instead of ForeFlight. While the customers said they’d eliminated that possibility, the only information I see on here is multiple screenshots indicating a successful connection and streaming of weather information from the FlightStream 510 to Garmin Pilot. 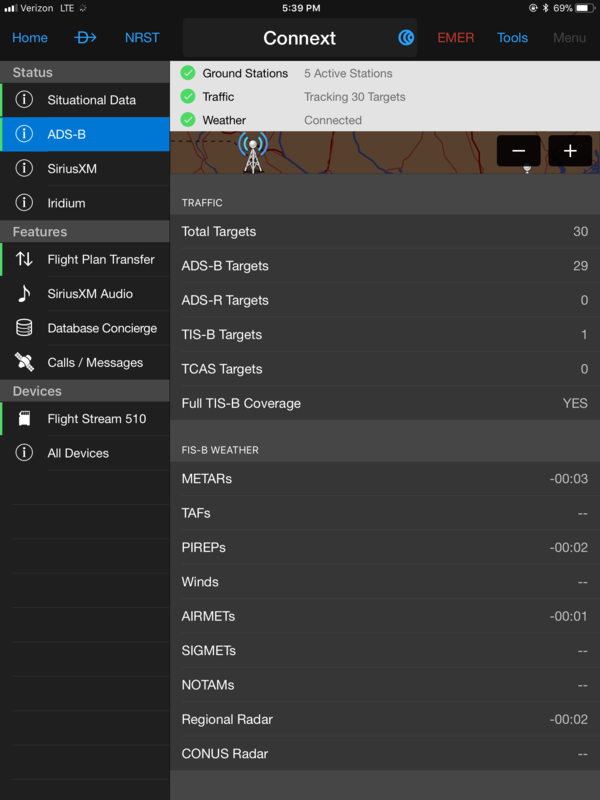 If this is the case and Garmin Pilot is able to receive the weather information from the FlightStream 510 it would heavily indicate that the issue resides within the ForeFlight application and it’s coded ability to connect/exchange weather information with the FlightStream 510. Please let us know if you have the chance to test that possibility as our engineers will need that important piece of the puzzle so we can determine what requires attention. So what did we take away from the Garmin tech support? First, on a personal note it was very nice to hear that they appreciated the work we put into documenting everything that is going on. I spent about 5 hours putting the first post together, bringing in all the different screen captures, writing up the post, etc. So it was nice to see that the effort was worth it and appreciated. 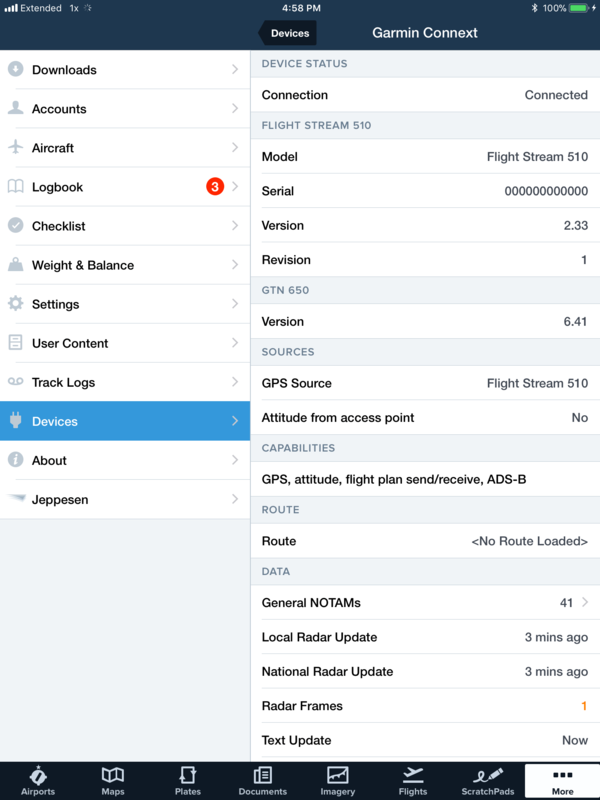 Second, it looks like we needed to test the Garmin Pilot app, and figure out if this is a Foreflight issue or a Garmin issue (Spoiler alert, it’s a Foreflight issue, Garmin Pilot connects just fine). Third, Garmin wants the latest software on the GTX345, hence the need to fly to CQW and have it installed. Note the Radar not available message. So on Monday both owners flew the plane to CQW, which is about .9 on the hobbs meter one way. Our able tech installed the update in about an hour (including some testing) and we were then on our way. We had an impromptu trip to Charleston, SC to pick up a friend and no weather on the Eastern seaboard so it was an easy day for a flight. As you can see we had pretty much CAVU weather everywhere. This screen shows that there is no radar available beyond what you see depicted. This was allowed to percolate for several minutes to see if additional data would display and it would not. This is something I haven’t mentioned before, but maybe it will help with troubleshooting. As you can see, we are over 30 minutes into the flight so data should be flowing (and is to the GTN and Garmin Pilot). Garmin Pilot connectivity screen capture, 1 of 2. Garmin Pilot connectivity screen capture, 2 of 2. As you can see, the Garmin Pilot app shows good connectivity, no errors, and radar updates that are all within several minutes. By all accounts the Garmin Pilot app is working correctly. I haven’t spoken about this error in the past but occasionally I am getting the above on Foreflight. It seems to be when we are having problems updating otherwise. I don’t ever recall seeing it prior to this new panel install, or in other aircraft with Garmin products. The above was taken while in flight, connected to the GTX345 after the software update. Radar data is updating only every 15 minutes, again on a set schedule. 4:00, 4:15, 4:30. The above was taken while connected to the 345 or the 510, I don’t recall exactly. The time stamp was now not updated for 15 minutes. It did eventually update at 4:15. Why it didn’t update at 4:00 I do not know. As you can see, the Garmin Pilot app appears to be connecting and updating correctly during this same time period. While CONUS radar is slow to update, as we would expect, the rest of the data is updating on a consistent and acceptable schedule. While working with Foreflight, and switching back and forth to the 510 and the 345, I found at this point that the 345 had completely checked out. As you can see, everything except traffic had stopped updating and we had zero towers connected. 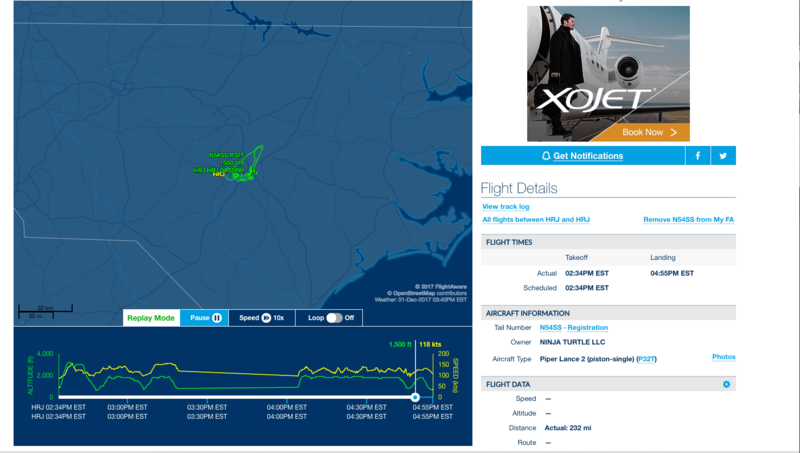 By connecting to our onboard Stratus, I was able to restore data long enough to get us on the ground in Charleston. As you can see, the Garmin Pilot app was having no issues at the same time. Bluetooth obviously was working and passing data to the iPad. But Foreflight was unable to use or load the data. For our return flight, we’d established that the GTX345 wasn’t working so there was no need for further testing. I connected to the Garmin 510 for the flight home and spent some time testing it. The first thing I noticed was the continued lack of data available after takeoff. Because the radar updates on the 5:00, 5:15, 5:30, every 15 minute blocks, we ended up flying till 5:30 (we launched just after 5pm) before we had the first update for radar. Again, there wasn’t a spec of precipitation to show on the radar and we’ve been told that our problem is that radar only updates every 15 minutes when there is nothing to show. However we haven’t had any weather to test with other than our initial flight back to HRJ where we did have weather but the updates were still only every 15 minutes. In other words, we are told it will work when we have actual weather, but we aren’t willing to trust this statement because the one time we had weather, it still only updated every 15 minutes. This is where and when we received our first data update with Foreflight, after 30 miles had been covered in the climb. Again, there is a lack of trust in what is displayed. During this time, the GTN650 and the Garmin Pilot app had updates that were 1-8 minutes old so weather information is being sent by the ADS-B network (not 15 as we were told). It is being received by the GTX345. 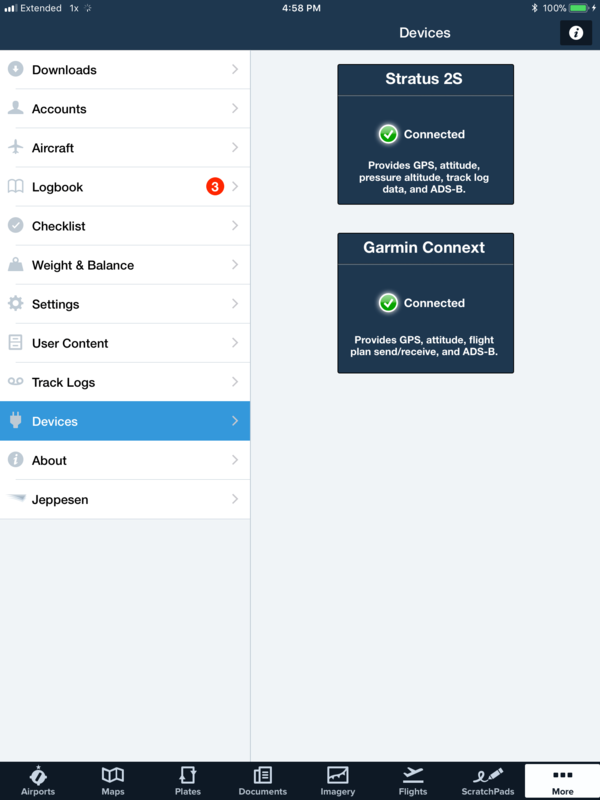 It is being passed to the iPad via the bluetooth connection, regardless of whether it is the GTX345 or the Garmin 510 because we see the updates in Garmin Pilot. What is not happening is it is not being displayed by the Foreflight app. Why there would be any schedule of updates controlled by Foreflight I have no idea. 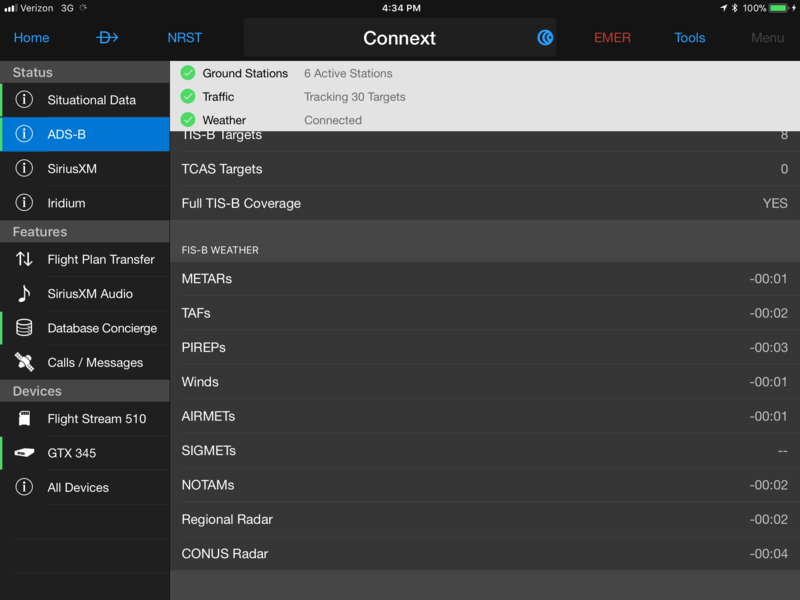 If new data is available and onboard, why would Foreflight not retrieve it and display it? Why wait 15 minutes, or 5 minutes? Once the GTX345 has new data, I would expect it, as a user, to flow immediately over to my iPad. However, having no in cockpit weather updates for a significant amount of time after departure makes flying in the weather a challenge. Basically there is a lack of trust in the depictions provided by Foreflight, and a lack of familiarity with Garmin Pilot. We need an acceptably VFR day but with some weather to display and we simply have not had that this fall and winter. The only weather days we’ve had in the last 30 days have been hard IFR and I’m not going to launch a questionable setup into hard IFR conditions. Two. Updating the GTX345 software made things worse, period. Connectivity was lessened and we seemed to introduce some instability into the data connection. This is very frustrating as we spent time and money to make things work not as well as they already were. This also jives with our internet friend who is chasing these same issues, as he’d already paid his local shop to update his software and it had not fixed the same problems. I actually believe if we could roll back to an old version of the software, maybe a 2016 version, we’d eliminate the issue. The GTX345s in the NC Wing for CAP are older units and my copy of Foreflight works just fine with them. Three. Version 9.5 of Foreflight is supposed to fix some of our problems and it has just come out the day after our last flight. Had we known the expected release date we likely would have postponed out test flight to accommodate this new release as part of our testing. For future reference, that would be good information to pass along to a customer. Also, I read through the release notes for 9.5, and there is no mention of this update fixing anything like what we are experiencing. Why is this problem not documented in a public location? Four. We have yet to disable bluetooth on the GTX345. Although I’m not as against it as I was before since the update to the 345 software made things worse, I still have not actually disabled bluetooth at this point. We will do that in a future test. However I still do not believe we actually need to disable bluetooth as it certainly doesn’t seem to be the root cause. We need to fly, again, to test, again, to see what Foreflight 9.5 does. Hopefully that will happen this week. We also have a flight coming up the 15th of December. This will be a non-test (family trip) flight so we won’t have the same level of data as our test flights, but hopefully this will allow some additional feedback on what we are seeing in a cross country setting with the new 9.5 release. We have another flight January 8th which will be out of the country. I fully expect to see some weather on this flight so we’ll have another data point for testing. All of these flights will be flown with the Stratus 2 as backup so that we can safely operate. 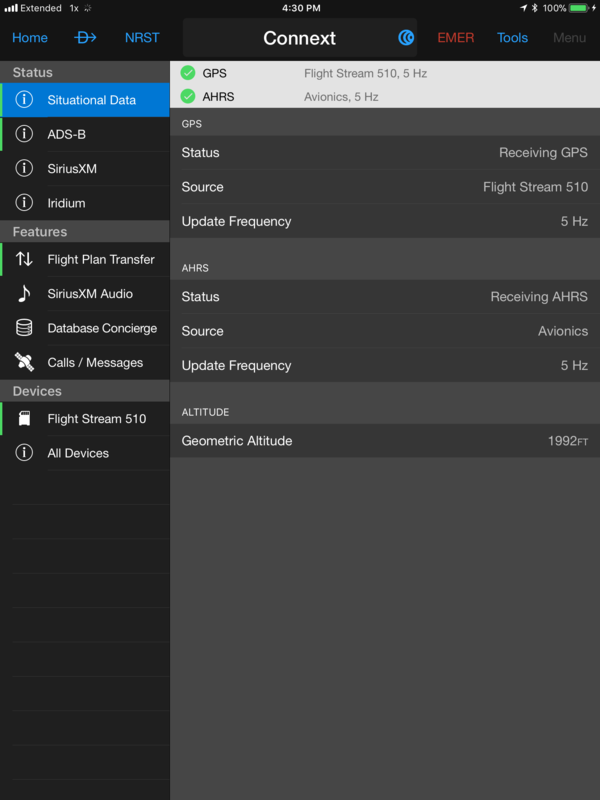 Foreflight updates and operates normally with the Stratus. Something that is particularly frustrating after spending 30k on a new Garmin panel. We will not be making any adjustments to our setup between now and after our January trip for fear of making things worse again, but we are anxious to hear of solutions to our problems from tech support. Something that we can look forward to testing after our January trip. Often I have a chance to fly with someone and despite our best efforts we end up flying into dusk or into full on night time. As the sun goes down and the light diminishes, I casually reach to my iPad and do this. The reaction I get ranges from “That’s cool!” to “That’s witch magic! How did you do it.” I’ve yet to have another pilot say, “Meh.” My wife, I couldn’t even get a meh out of her, but that’s different. My fellow pilots are anxious to change their iPads too, but I can never remember all the steps to setup an iPad for night mode. Fortunately I can link the original story here where I learned how to do it. Now I can just direct my friends to this site, which will redirect them to this article where I originally learned this trick. See tip #8 for how to setup night time mode. Then apply tip #4 to put this red only mode on a triple click quick access. But DON’T actually do tip #4 as it’s described. I find invert colors just confuses things and red only mode is all you really need for night time flying. Also, red only mode does wash out the display of some charts. If that’s an issue for you, it’s quick and easy to triple click back to normal colors, see the thing you are struggling to see, and then triple click back to night time mode. With the screen auto adjusted down to minimal light anyway, it doesn’t seem to hurt much to look quickly at normal colors then switch back. Today I believe I have discovered the root cause, or at least the source of our error. It appears to be the Garmin 510. I will describe what I did, and what I found below. The suggested resolution is at the bottom of this post. I received the following email, forwarded to me from our installer today. This was from the Foreflight tech support. “Could we try and get some detailed information from you? 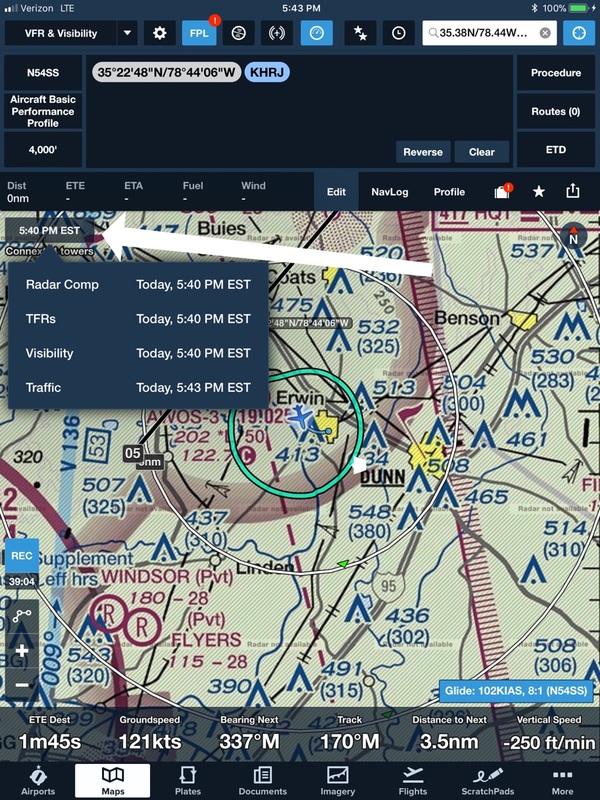 While connected to your Garmin devices, open ForeFlight select **More** (**Menu** if using an iPhone)> **Device** > please take a screenshot of this page >Next, tap on the Flight Stream Connext tile and take a screenshot of this page. Today I decided to go back down to the airport and gather the requested information. Nothing was mentioned of whether I should be in flight or not to show this data but I assumed we needed to be receiving ADS-B towers to get usable information so I went up for another test flight. The weather was once again severe clear with no precipitation anywhere in the area. For this flight, I again went up with the same two iPads described in the previous post. I also took the same Stratus 2. 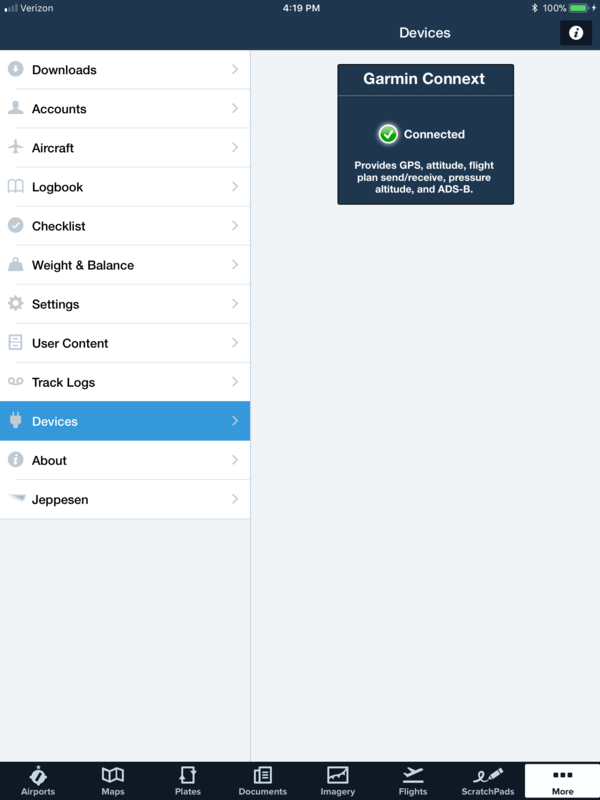 One iPad was initially configured to bluetooth to the Garmin panel, one with wifi to the Stratus. 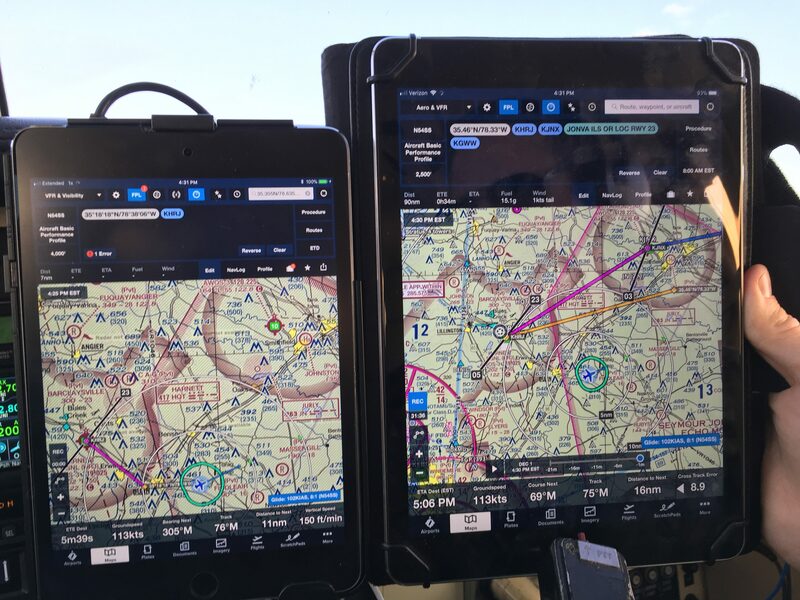 The first screen captures were from the iPad connected to the Garmin panel, both GTX 345 and Flight Stream 510. The iPad connected to the Garmin panel, both to the GTX345 and the FS 510. The above was the configuration right out of the box, after takeoff and once towers were in view and data was flowing. The below was what the map screen looked like. All of these were taken within a few minutes of one another, as fast as I was able to take them, fly the plane solo, etc. iPad connected to the Garmin panel, map view in Foreflight. Note the “radar not available” message. 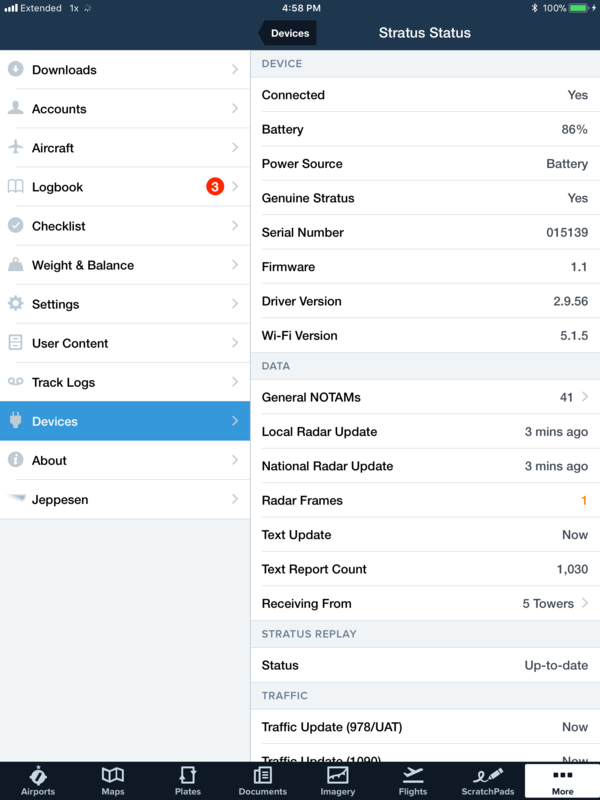 Since our previous test, I’d installed Garmin Pilot onto my iPad mini that normally is used with 54SS. I still don’t have any experience with Garmin Pilot, but I tried to grab any screen shots that may prove useful. Again, these are taken on the iPad connected to the Flighstream 510 and the Garmin 345 via bluetooth. Here I have an iPad connected to the panel via bluetooth, and the Stratus via wifi. It was an accident that I had both at once, but I thought it may show you something as the radar was being received and there was no error message. Once I had captured the requested screen captures, I started doing some experimenting. Here is what I found. iPads connected to the Stratus showed no errors, as before. iPads connected to the Garmin panel, both to the GTX345 and Flightstream 510 showed the “radar not available” message. This error is consistent. iPads connected to ONLY the 345 or the 510 showed the same issue as before, “radar not available” the same as in the test on 12/1/17. However by allowing about 15 minutes for the data to stabilize/update/whatever, I found the iPads connected to the GTX345 ONLY would eventually remove the “radar not available” message and the grey crossed lines. 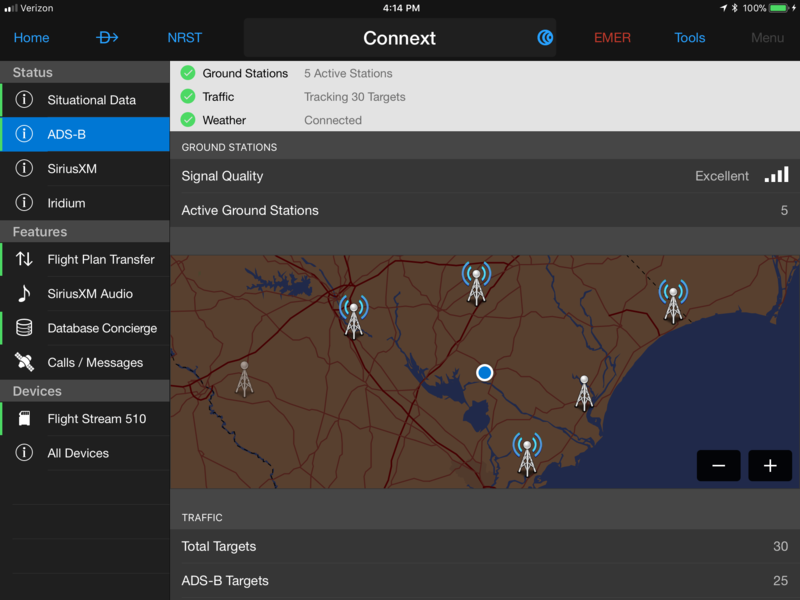 However, iPads connected to the 510 ONLY would continue to display the “radar not available” message for as long as I let the test run. In our prior test, we did not allow a full 15 minutes for the changes to take effect, mainly because when we connected to the Stratus the error message disappeared with 60 seconds so we expected a similar result from the GTX345. That is the difference in this test on 12/4 vs. the last test on 12/1. I was able to replicate the issue across two iPads. Whichever one was connected to the 510 only, showed the problem. The problem could be eliminated by connecting to the 345 only, or of course the Stratus. I did note that even when the iPads were working as we would expect, with no “radar not available” messages when connected to the GTX345 only, that the data refresh was different still than what is shown on the GTN650. The data would consistently be only 2-3 minutes old on the GTN, but maybe 10 minutes old on the iPad, even though it appeared to be working properly. It appeared as if the 15 minute update issue is still present, but it’s not 15 minutes now. It’s 10 minutes, or 5 minutes. As you look through these screen captures, understand that I am flying single pilot in this test, with the sun going down blinding traffic search in about 40% of the sky, trying to avoid traffic that was in the area. I couldn’t just stare at the update results, but it appeared that every update on the iPad was at 4:30, or 4:35, or 4:40. I didn’t see any updates at 4:32 or 4:36, it was always on an even number (I know 5 is odd, I hope you get my meaning.) Here are all the screen captures I took at all stages. Note the update time stamp showing the time sequence I reference, while the actual time stamp at the top changes. When I would pull up the GTN650 time stamp, it would consistently be updated to what I’d call a random time, 4:37, 4:29, etc. The GTN time stamps are also consistent with what I see when flying other airplanes, the data block on Foreflight doesn’t update on even times when flying those planes. Picture of both iPad iPad connected to GTX345 only and GTN650 with update as of 2-3 minutes ago. Picture taken at 4:54. I apologize the above picture is blurry. Single pilot and all that. As you can see in the above picture, the picture was taken at 4:54. The last update is 4:40, which has just turned orange indicating it has gotten old. This was during testing, so it took a few minutes for the iPad to update to the latest information after it connected. However in this instance it took several minutes, till 4:55 if I remember correctly, which you can see the result of in the previous screen capture just above. However what is concerning is that even with a proper connection, and old data, the iPad doesn’t update from the GTX345 for almost 15 minutes even though the GTN650 has data that is only 2-3 minutes old. It’s possible that this is just a reporting issue where Foreflight reports updates differently that the GTN650, however since this is an issue that I don’t see replicated in the CAP aircraft I fly with the same iPad, I think it’s another issue with our installation. Interestingly, when I connected to the Stratus, the radar not available message goes away almost immediately. When I connect to the GTX345 it takes as much as 15 minutes for the message to go away. However I seem to recall that the Stratus buffers/saves data so that it can be delivered in a burst when connected to an EFB. Something about it being used with devices that are operating on batteries. I assume that the GTX345 has no such feature since it’s designed to run on ships power and operate continuously. Since the 510 is such a small and easily removable device, my recommendation is to ship a replacement 510 directly to myself to be installed locally. I can then test fly with the replacement 510 to see if the problem persists. This is opposed to shipping the 510 to Pee Dee in SC, necessitating a another flight to maintenance. If the replacement does not fix the problem, we know we have a software issue. If the replacement solves the problem, we know we had a bad device. Regardless, we can return the extra or bad 510 once we have tested. All it will cost is overnight shipping both ways which is less than the cost of a flight to SC. However tech support may have a better idea once they have this additional data. 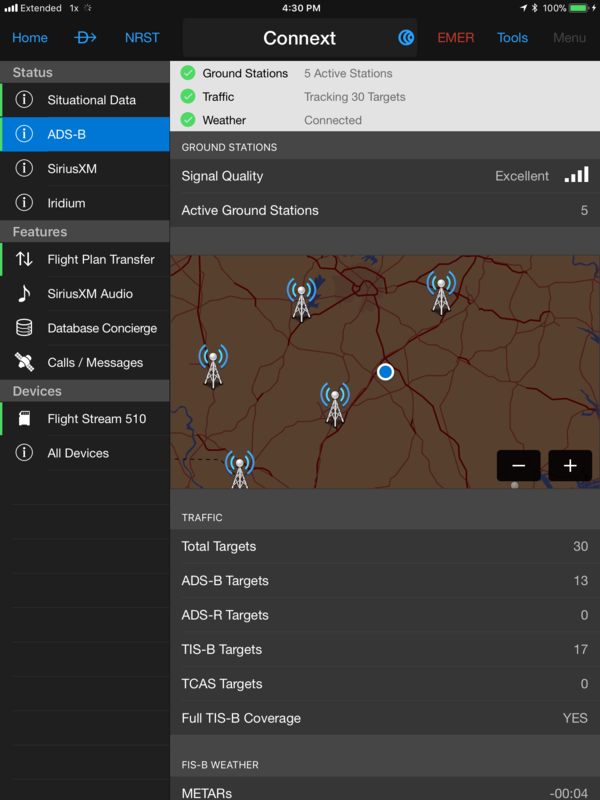 This page is published as a public repository of all of the information we have concerning the issues we’ve had with our ADS-B install on N54SS. It is intended as a central knowledge reference for any and all technical support who are assisting us in coming to a successful conclusion to our ongoing issues. Nothing stated here is intended as a slight towards anyone or questioning anyone’s expertise or efforts. It is simply a statement of the facts as they are known at the time. I will update this page, or this blog, with our progress in solving the issues going forward. All images in this post are clickable to improve detail clarity. Many require clicking to see the needed detail. 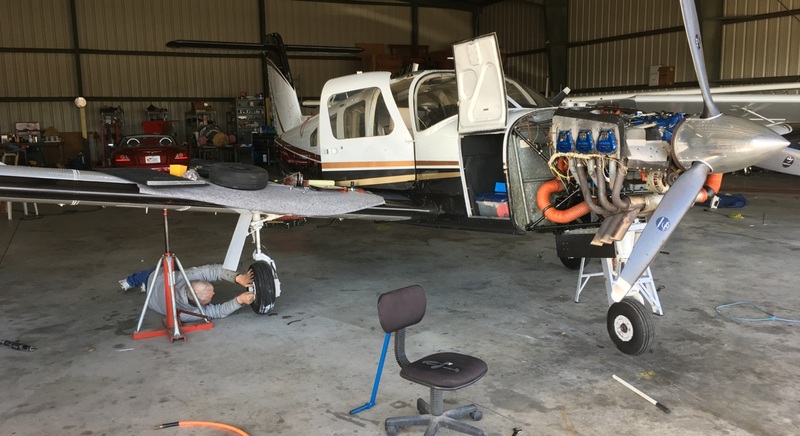 This is a summary of the issues we’ve seen and continue to see in our testing of our new Garmin installation in N54SS, installed by Pee Dee Avionics in Cheraw, SC between August and September of 2017. There has been no indication of issue with the actual installation, only with the devices once they were installed. This is also detail of the test flight data we’ve collected from multiple test flights (11.4 hours total) over the past months, but primarily it comes from a three flights conducted on 12/1/2017 as these contain the latest information. The reason for conducting these tests in flight is because our local field (KHRJ) does not have an ADS-B tower in view from the ground. However, immediately upon takeoff we have multiple towers in view. Most flights were conducted orbiting near the airport at 2000 feet MSL. There are two owners of N54SS, Dan Moore, and Daniel Cooke. They live one hour from each other, and the home airport (KHRJ) is directly between the two of them. It is unusual for both owners to be at the airport at the same time due to scheduling conflicts. Most test flights have been conducted by Dan Moore, but thankfully the test flights on 12/1/17 were conducted with both Dan’s in the cockpit. All in panel avionics powered and operating normally. Primary iPad mini in panel mount, iOS 11.0.3, connected to GTX345 via bluetooth and Flightstream 510 via bluetooth. Secondary iPad 4, iOS 11.1.1, connected to a Stratus 2 via wifi. Iphone 6s, iOS 11.1.2, connected to GTX345 via bluetooth and Flightstream 510 via bluetooth. Additionally on our last flight on 12/1/17, we connected an additional iPad to the Flight Stream 510 via bluetooth. This iPad was running Garmin pilot. We traditionally only use Garmin Pilot to update the database. 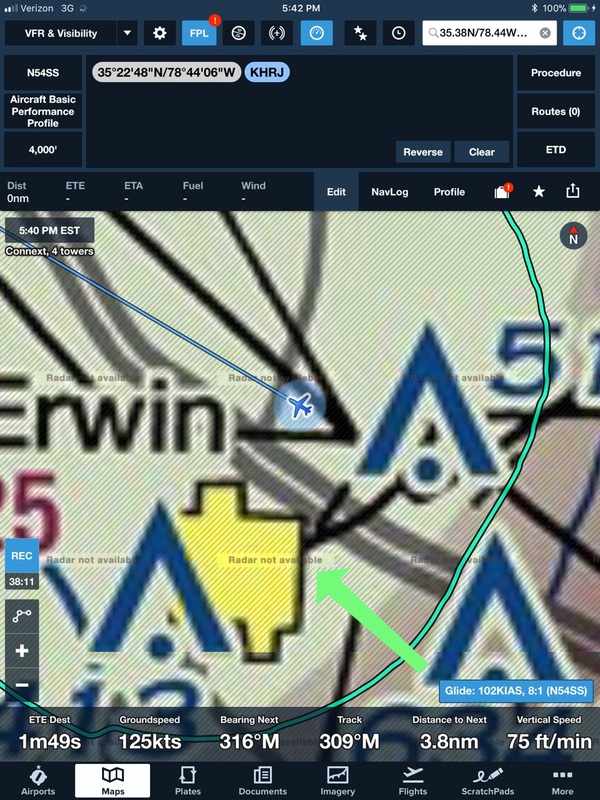 The latest data from ADS-B information block as shown in Foreflight and noted by the arrow. The data in this picture has been expanded to show the additional time stamp info in this instance. We have had several failure modes since the original install of the Garmin products. The first was that data block, as noted in the picture above by the arrow, showed that “no data” was being received despite being connected to multiple towers. We were able to receive and display ADS-B traffic and METARS, etc, but no radar. This issue was corrected, we assume, by a software update performed by Pee Dee Avionics on 11/6/2017. It has not manifested with this particular failure mode since the software update. However the flight home from KCQW to KHRJ is shown above in Flightaware.com. While there was no weather in SC that day, there were returns in NC, some relatively close to the flight track. This is the flight where the data block only updated every 15 minutes. With weather on the radar, the regional radar should be updating every 2.5 minutes. Also, other aircraft I fly in with GTX345s update much sooner than every 15 minutes. However, this issue has since disappeared and the updates seem to be happening normally. There was no service work performed to explain this change in operation, nor software updates to the panel mount avionics nor the iPads in use so we have no explanation for why the updates are back to being every few minutes. When we flew the last series of test flights, there wasn’t a radar return for 500 miles so by the explanation we were given, it should have updated every 15 minutes instead of the 2-5 minutes it was performing. 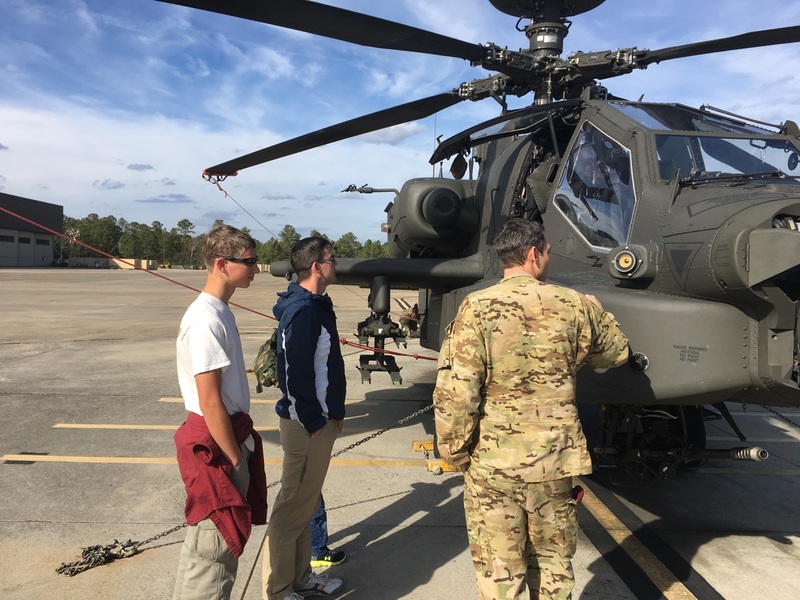 On 11/24/17 N54SS was flown to KHEF and back on a trip spanning several days. The pilot reported that his Foreflight display showed “Radar not Available” on his map in Foreflight for the entire flight. This iPad was connected to the GTX345 via Bluetooth. Radar not available. It’s only viewable when zoomed in very closely. On the first test flight on 12/1/2017 I first flew the airplane alone, waiting for the other pilot to arrive from work, and to test another problem that we had (this one was pilot induced). I did not note the “Radar not available” on my iPad but I found when shown by the other owner that it was indeed there. You need to be zoomed in fairly tight in order to see the words. There is also a series of cross grey lines that I had noticed but didn’t recognize for what it was until it was shown to me by the other owner. When in this failure mode, despite showing radar updates per the data block, the entire map is greyed out and “radar not available” covers the entire chart. After being shown the failure mode, both owners took the airplane back up for another test flight on 12/1/17 and were able to demonstrate the “radar not available” issue readily. 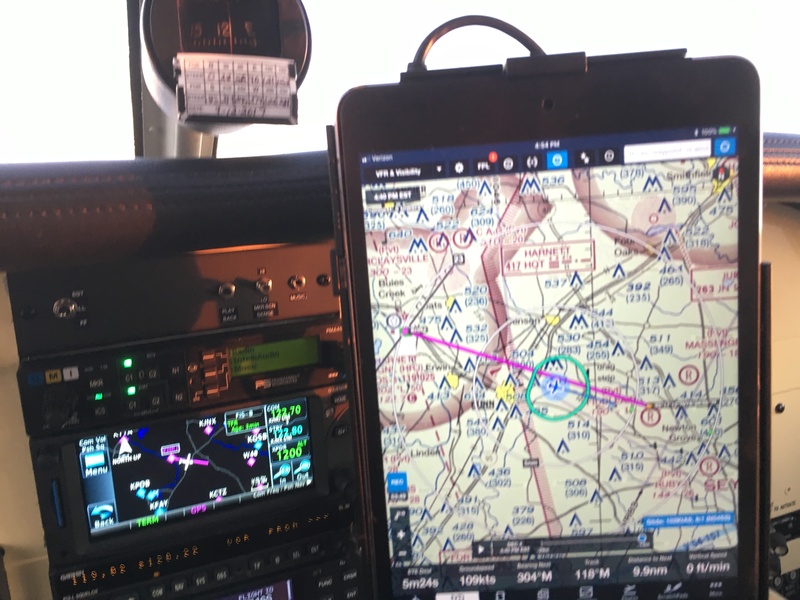 We compared the iPads connected to the Garmin panel mount avionics to an iPad connected to a Stratus 2. The picture below is a side by side comparison from in flight. This picture is full resolution so you can click on it to make it bigger. Only at full size do you notice the grey line pattern on the left iPad. It’s much easier to see on the screen capture above. If you click on the image to view it full size, you can see that there are faint gray lines on the chart on the left iPad. The iPad on the right shows no such lines, it is receiving radar. For testing purposes, we connected and disconnected various iPads to the panel mount avionics, and to the Stratus. When the iPads were connected to the panel mount avionics, the radar not available issue was consistent regardless of the iPad in use. Also, when the iPad not receiving radar was connected to the Stratus, the “radar not available” went away immediately. This does not appear to be an iPad issue. In addition, we grabbed a screen capture of the failure mode on the iPhone. Here the grey cross hatch lines can be seen easily. However it is not zoomed in enough to see the words “radar not available” except at the very bottom of the map behind the glide information. You can also note that the iPhone showed no data. There was a period of time on the second test flight where all the connects and disconnects seemed to disrupt everything. Devices didn’t match each other, some had issues connecting, etc. This was a test environment with lots of button pushing. We landed, powered down the airplane and avionics, and powered down all portable devices and booted them fresh for the last test flight. Picture taken at 4:37. The time is just cut off in this picture. We also tried to compare the data from the GTN650 to the data shown in Foreflight. This picture is also full resolution meaning you can click on it and get a better view. The FIS-B data on the GTN650 shows three minutes old at 4:37 or it was received at 4:34. The latest data block on the iPad shows 4:25, 9 minutes older than the data shown in the GTN. Again, this iPad is connected to the Flightstream 510 and GTX345 via bluetooth so I have no explanation for why the data on the iPad would be older or at a different refresh rate than the GTN. 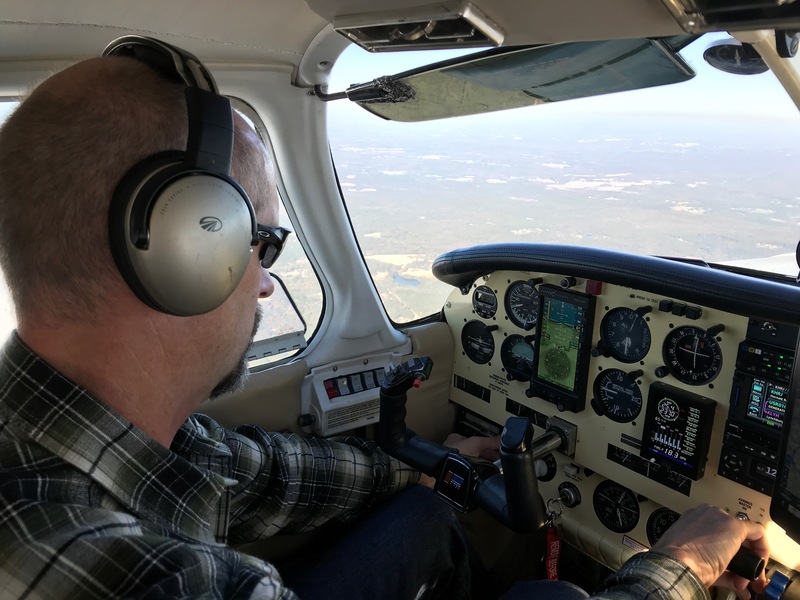 When we landed again, we decided a last test would be to install Garmin Pilot on one of the iPads and fly again with Garmin Pilot connected to the panel mount avionics. Neither of us are very familiar with Garmin Pilot so there was some time spent trying to find similar information in the application. 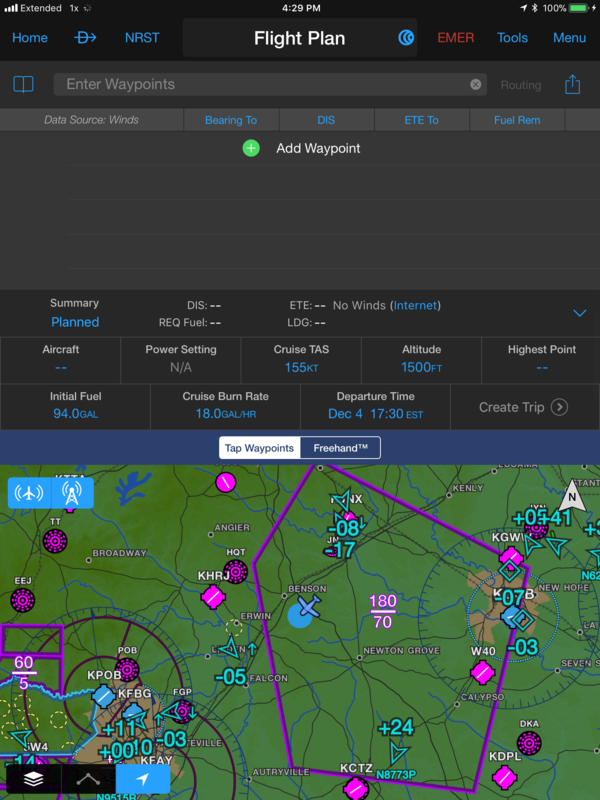 These screen shots are as close as we could come to showing some helpful information on Garmin Pilot, because of our limited familiarity. Lastly, I routinely fly with the Civil Air Patrol’s NC wing. 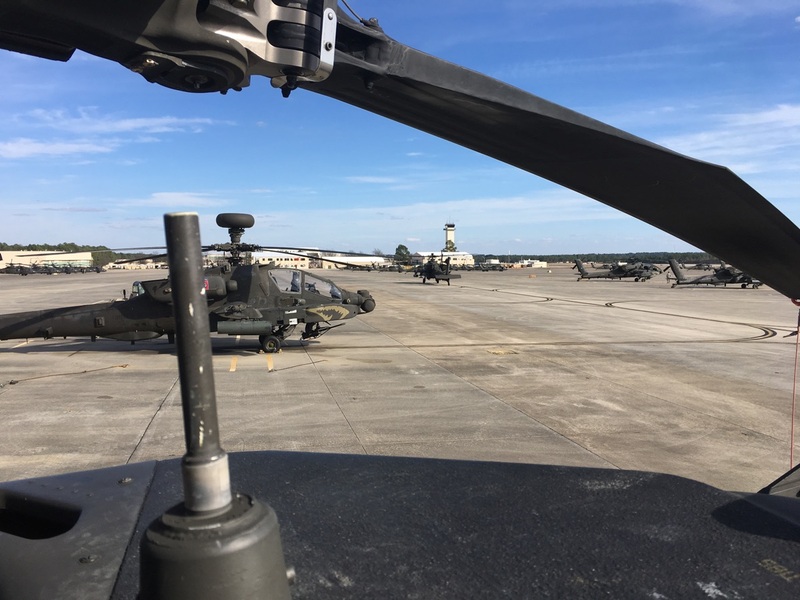 NC Wing has equipped all 17 of their aircraft with Garmin GTX345s. I connect my iPad, the same one used in these tests, to the Civil Air Patrol aircraft via bluetooth when flying. My experience in the CAP aircraft is that everything discussed here works flawlessly. The data block updates every 2-5 minutes regardless of weather conditions, or lack of weather, radar is shown (no grey lines, no radar not available), METARS update, etc. Also, in flying with the Stratus 2, I find that the issue discussed above also do not happen. In our testing on 12/1/17, we found that the Stratus began transmitting data to the iPad almost immediately upon takeoff whereas the GTX345 took several minutes to begin transmitting data. We never once had an issue with update rates, radar not received, etc. from the Stratus. There have been several theories submitted for what is going on. Radar data only updates every 15 minutes because there is no weather to report. There are too many devices using Bluetooth, and it’s causing a bandwidth issue. For the first theory, the Flightaware.com track from 11/6/17 for N54SS shows weather in the region. Per the details forwarded by Pee Dee Avionics, updates should have been happening at 2.5 minute intervals because there were radar returns in the immediate area. I do not believe the update rate from the FAA is the issue. For theory #2, We tried several things to mitigate connectivity issues. We flew with only one iPad connected to the panel mount avionics, and nothing else powered up. We removed several devices from the bluetooth page on the GTN, narrowing down to the test device or devices depending on the individual test. We connected different devices at different times to eliminate any issue related to one device. Basically we rotated all connections through all devices to make sure no problem stayed with one iPad. We powered everything up, Stratus, all iPads, iPhones, a non-apple phone, everything. With the exception of the non-apple phone, everything worked as before with no inconsistencies other than the problems described. We were not able to connect the phone during our test, but it had been connected previously. It is the one we utilize to update our databases. Finally we connected devices that were not showing radar to the Stratus. They would immediately eliminate the “no radar” message and the grey lines. We would then reconnect to the Garmin and the “no radar” message and lines would reappear. The issue is repeatable and tied directly to the Garmin products installed in N54SS this summer. From a customer’s experience, these issues have been present, in one form or another, since the products were newly installed. We have eliminated iPad issues and Foreflight issues via our testing. These issues are a direct result of our initial install with these products and I believe are a software issue internal to the Garmin products. I do not know at this time if the issue is related to the Flight Stream 510, or the GTX345. After 11.4 hours of testing, I’d like a better opinion of what we are going to fix before I make another flight to either test or reposition to maintenance in SC. In May of 2016 I, along with my then 12 year old son, attended the AOPA fly in in Beaufort, NC. Since I was already there, I decided to take the Rusty Pilots program. 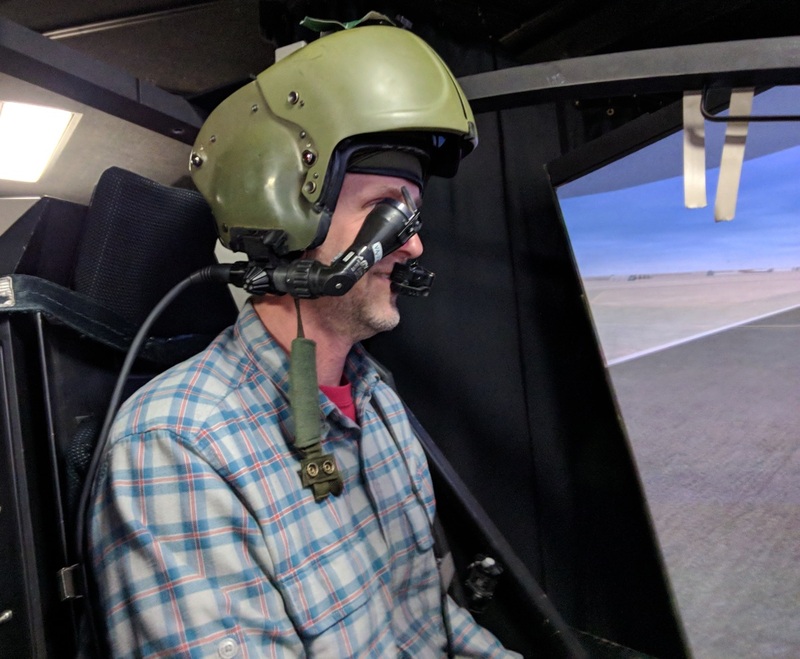 I was of the opinion that I’d forgotten too much to get back in the air, and I was a bit nervous to go into a classroom and demonstrate just how much I didn’t know. I still had a pilots license in my pocket and as long as I didn’t prove I was clueless, I was technically still a pilot, able to impress people at parties and tell funny or harrowing stories on demand. If I attended class and proved how much I didn’t know, well then that would be more than embarrasing, it would be tangible proof I no longer was a pilot. But with the class available right there with the fly in, I really couldn’t not attend. I’ve been a consistent AOPA member since the early 90s, and I’d always considered going to MD to attend the fly in but never could justify the trip. Major kudo’s to AOPA for bringing the fly in out to the field. I don’t know how I’d have gotten back in the air if I hadn’t attended. I’d stopped flying in mid 2004 when I had to take over our family business when my father had cancer. I’d gone from flying a King Air 200 solo to flying a desk, and I did so from 2004 to 2015 when I sold the family business. The sales process was brutal, and one of the things I told my wife as I went through the 1.5 year process was I’m going to buy an airplane when I get this done. She was always supportive, except for one time I’ll get to in a minute. Step one for me was to get my medical back. Luckily it was a non-event for me. I’d recently lost 60 pounds and I was now farming every day so I was in pretty good health. With the medical out of the way, step two was to find a partner in an airplane. I don’t hang out at the airport or really know anyone at the airport any longer. I didn’t have a way of contacting someone like minded. There were no flying clubs near me that offered what I needed (a six seat go places airplane) so I was stuck. In desperation I placed an ad on Barnstormers looking for a pilot/partner. I only had one response, from some guy who was still getting his PPL. No way he’ll be able to get insured in the type of aircraft I need. He’s just dreaming. It turns out he has been the perfect partner and I couldn’t be luckier. He and I purchased a 1978 Lance in May 2017 and we’ve already put over 100 hours on it. We just upgraded the panel to a GTN650 with the Flightstream 510 to let the iPad talk to the GPS wirelessly. Modern avionics are AMAZING and they are one of the reasons I’ve come back to flying. While I was at the AOPA fly in, I also talked to the Civil Air Patrol recruiter. My son was 12, the perfect age to join. I shoe horned him into a conversation with the CAP recruiter and stood back proudly as I watched her lure him in. As I was standing there, a Marine pilot asked me what I did. When he found out I was a pilot, he put the hard press on me to join CAP as well. Have you ever tried to push someone into the pool, and ended up falling in yourself? That’s what happened to me. So in addition to flying myself and my family around, I am now 1st Lt. Moore, flying CAP aircraft in training and on missions. Between my plane, and the CAP plane, I have over 110 hours in the last 12 months. Most of that (80 hours) is in the last 6 months. Things are picking up. Now back to my wife being supportive. Before I purchased the Lance in May, I’d mentioned, again, that I was going to buy a plane to the Mrs. “I don’t know why you’d do that. That’s a bad idea.” I was immediately defensive, but she continued, “If you are going to get a plane, you should build a plane with your son. That would be a great experience for him and for you.” This was back in 2014 I think. Since that conversation, I’ve been to Sun N Fun and Oshkosh (both for the first time) and have finally selected our project. It is going to be a Just Aircraft SuperSTOL, which was purchased in October 2017. 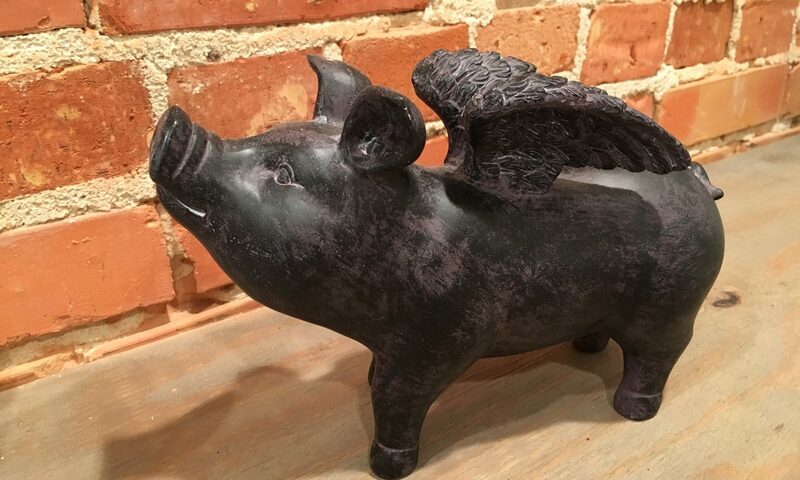 We start in March of 2018 with hopes to be flying by spring of 2019. I’ve already started a blog to document the build at farmerflier.com so hopefully anyone later can learn from my mistakes. In January 2018 I am flying the family to the Bahamas for a vacation, our first aviation vacation as a family. So from a Rusty Pilots seminar in 2016, I now fly as a volunteer pilot for CAP, fly a Lance for myself, and am building an airplane, and am in the process of being an airplane blogger. I’ve completed my EAA Young Eagles checks and am signed off as a pilot there. Once the SuperSTOL is finished, I plan on flying the wings off of it for Young Eagles flights. I’m more involved in aviation that I’ve ever been. So what got me back to flying? Swallowing my pride and going to the Rusty Pilots program was first. I went from nervous, to excited, to actually a bit bored at one point. I remembered SO MUCH of what I needed to know. The rest wasn’t the difficult to relearn. IFR proficiency has taken a while but the basics of flying came back like they’d never left. Was I passionate about flying? I still read Flying magazine and AOPA’s magazine, but that was about it. I could have never flown again and been happy. I’d been there and done that, and I had plenty of other chores to keep me busy (I was working about 80 hours per week during all of this). What changed for me was ADS-B, in-cockpit weather, in-cockpit traffic, GPS approaches, and Foreflight. The amount of information that I have at my fingertips when flying a NORDO aircraft is well beyond what was in the fanciest jet when I stopped flying in 2004. Situational awareness is ridiculously easy and the real struggle is to still do the homework on the ground because so much is available in the air. The AOPA Rusty Pilots program was the spark that relit the fire for me, but the technology is what is pouring gas on the flame. My iPad isn’t simply a lightweight replacement for my old Jepp binders. It is a safety item that I won’t leave the ground without. As more technology becomes reasonably available, thanks to the efforts of AOPA and EAA and the FAA (i.e. Garmin G5, TruTrak autopilots, AoA, etc), I think aviation gets better and better. I don’t need an $800,000 Cirrus to be mission capable. An affordable older aircraft will give me more than I ever had before with an iPad and a required transponder. Or a SuperSTOL flying at 500 feet and 100mph has all the capability of a Gulfstream, as long as I don’t want to actually go anywhere. Today, Dustin and I made a $100 hamburger run to Virginia. Except we weren’t hungry, we were thirsty. We’d been on vacation about a month ago in Virginia and had toured the Virginia Distillery Co. I’d brought home a few bottles of their different whiskeys and seemingly before I could blink they were all gone. I’m not saying SWMBO drank a bottle of whiskey nearly by herself in a week. I’m just saying there was definitely a containment problem with the whiskey and by the time I’d gotten to the bottle, it was pretty much empty. No clue how that could have happened. Today the weather was severe clear and not a cloud in the sky. Dustin and I trundled down to the airport about 8:30am, after a mandatory stop at Angie’s for breakfast. We pulled the plane out and fired it up and headed North. 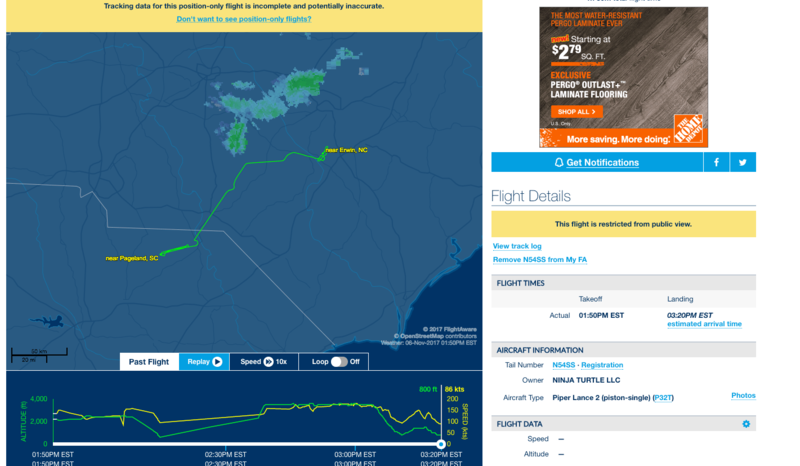 We did a quick jog to the West to stay clear of RDU’s airspace, passing over Jordan Lake and then Chapel Hill before turning due North towards Lynchburg. The pattern was busy at Lynchburg, the flight school keeps the controllers hopping. But we fit into the flow after some adjustment and I had a landing of 4 out of 10. Dustin politely said he’d had worse. We made introductions in the FBO and borrowed the courtesy van to make the drive to the distillery, about 35 minutes door to door. We arrived at the distillery and ran into some of the same great folks we’d run into before on our tour. When they found out we’d come just to buy whiskey for our home bars, they were pretty excited. Is there a limit to what you’ll do for whiskey? I’m not sure I know of one. What I didn’t tell them was it was SWMBO’s birthday this month and I wanted to bring her back some of the ingredients for the drink she loves so much so this really was a honey do item on my list. 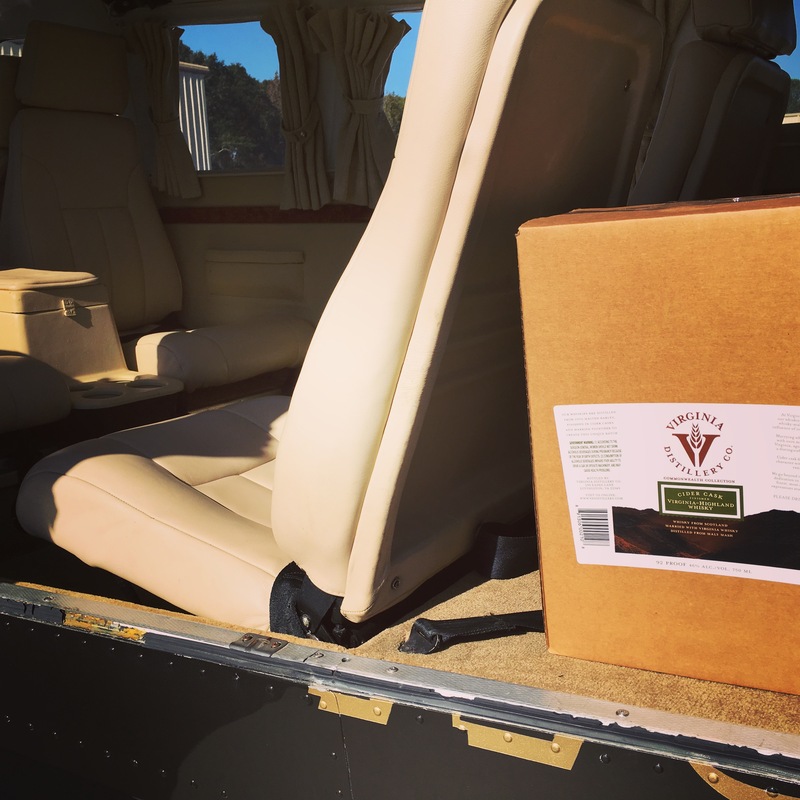 We loaded up a case of booze for our return trip and high tailed it back to KLYH for our return flight. We shot the GPS 23 approach into KHRJ, testing out the new avionics setup. It mostly worked well, but the glideslope capture didn’t work for some reason. Oh well, more to learn and test I suppose. At least my landing didn’t break any of the bottles in the back. Mission to get booze via airplane. Check!